© 2002, © 2018 by Paul Freeman. Revised 8/16/18. 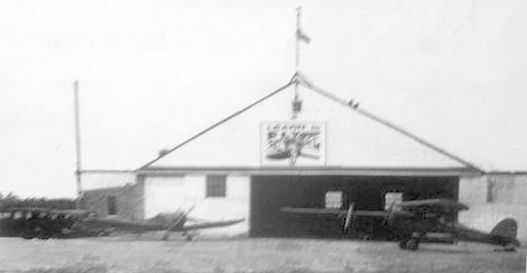 A circa 1940 photo of a Fleet Model 2 biplane in front of the wood-tin hangar at Bender-Brentwood Airport. 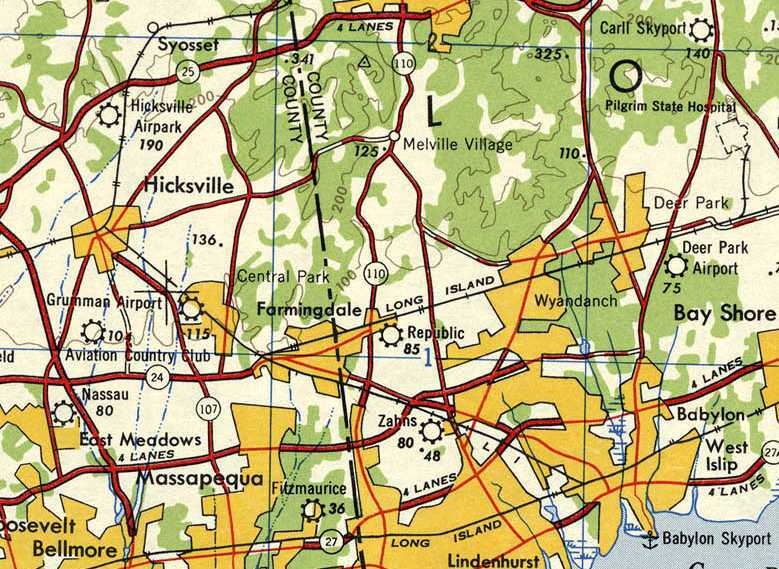 Central Islip Field was reportedly founded in 1929. It was taken over by Harry Bender in 1933 & renamed Bender-Brentwood Airport. 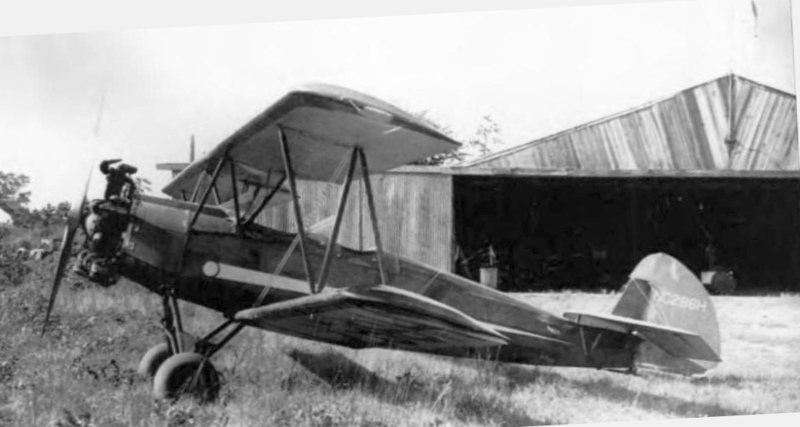 The earliest depiction which has been located of Bender-Brentwood Airport was a circa 1940 photo of a Fleet Model 2 biplane in front of the wood-tin hangar. Bender-Brentwood Airport was said to consist of 33 acres, and to have 1 hangar housing 3 planes, with several others tied down outside. 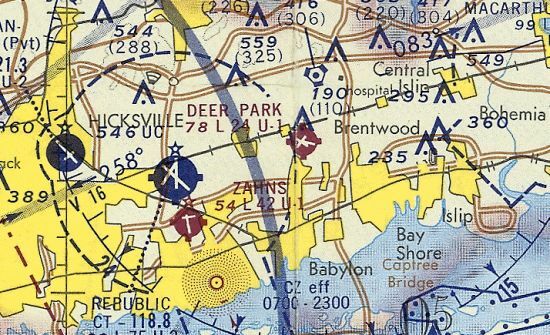 The earliest aeronautical chart depiction which has been located of Central Islip Airport was on the November 1931 NYC-Albany Air Navigation Map. perhaps as one of many small civilian airports closed during WW2. 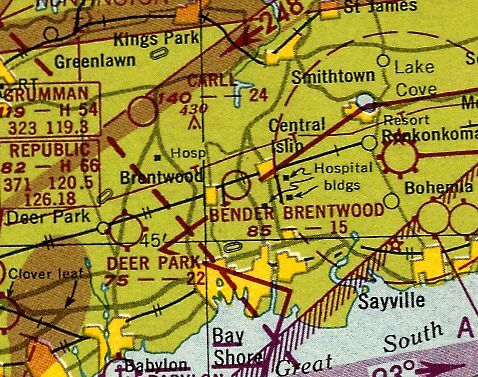 The 1949 USGS topo map depicted Bender-Brentwood Airport as a commercial/municipal airport. depicted Bender Brentwood as having a mere 1,500' unpaved runway. depicted Bender Brentwood as having a 1,500' unpaved runway. as an S-1 commercial airfield with a 1,500' unpaved runway, a hangar, offering minor repairs & fuel. 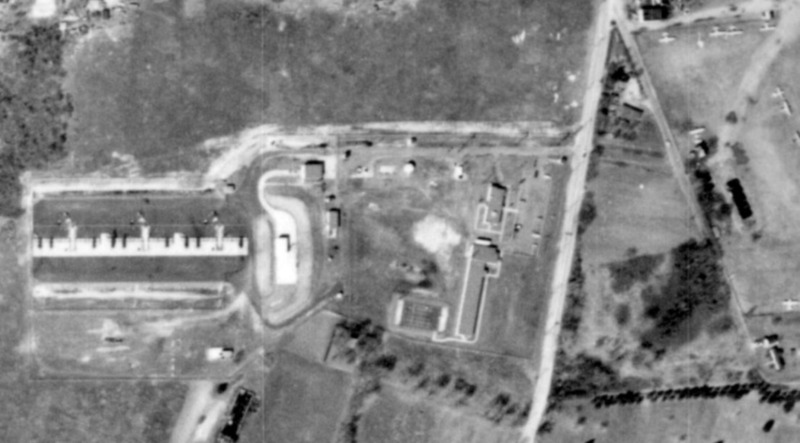 The earliest aerial photo which has been located of Bender-Brentwood Airport was a 2/15/54 USGS aerial view. and at least 5 light aircraft parked around some small buildings on the southeast side. 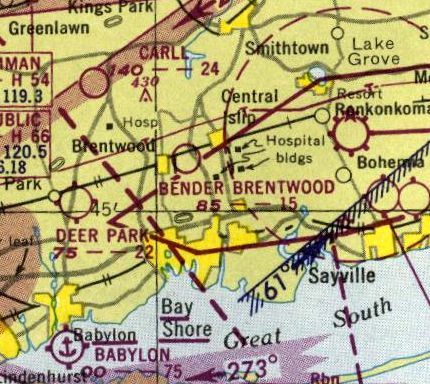 The last aeronautical chart depiction which has been located of Bender-Brentwood Airport was on the 1955 NY Sectional Chart (according to Stephen McNicoll). which may indicate that it had been closed by that point. as it was no longer depicted on the 1957 NY Sectional Chart (courtesy of Mike Keefe). 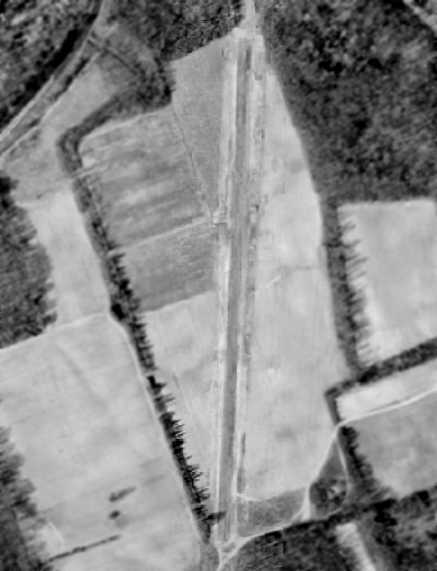 A 2014 aerial photo did not show any remaining trace of Bender-Brentwood Airport. 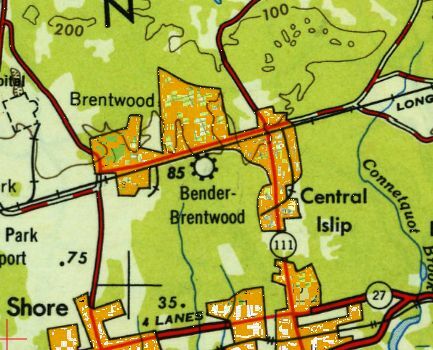 The site of Bender-Brentwood Airport is located southwest of the intersection of Route 111 & Route 100. Thanks to John Dolan for pointing out this airfield. An 8/4/28 of the dedication ceremony at Islip Airport (courtesy of Andrew Muir). The original airport for the town of Islip was located just north of the town along Route 111. This 25 acre general aviation airport was established in 1928, having two 2,000' grass runways & 1 steel hangar. It was founded by Charles Lawrence, the designer of Wright radial engines. Islip Airport's 8/4/28 dedication ceremony was attended by Amelia Earhart. The earliest depiction which has been located of Islip Airport were 2 photos of its 8/4/28 dedication ceremony (courtesy of Andrew Muir). depicted 2 monoplanes & a biplane in front of a hangar. The earliest aeronautical chart depiction which has been located of Islip Airport was on the November 1931 NYC-Albany Air Navigation Map. 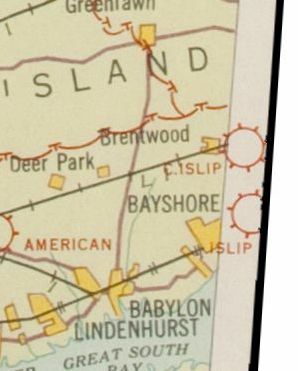 The 1935 Regional Aeronautical Chart depicted Islip as an auxiliary airfield. John Dolan recalled, “The original Islip Airport... 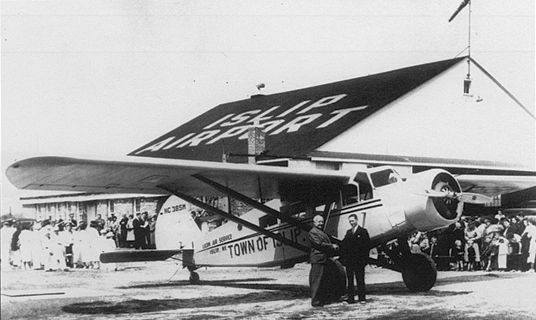 It's notable as the home of the first airline service between Long Island & Connecticut. 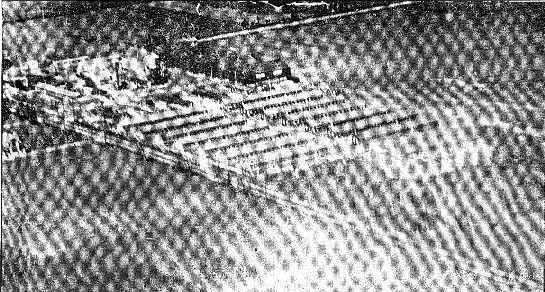 The earliest aerial photo which has been located of Islip Airport was a 1938 aerial view (courtesy of Andrew Muir). It depicted Islip as an irregularly-shaped grass field with a single hangar on the southeast side. in front of a hangar marked “Islip Airport” during the occasion of Suffolk County's first airmail flight. and seeing the old hangar with the big airport rotating beacon on the roof. My dad took me there once to see airborne paratroopers practice. 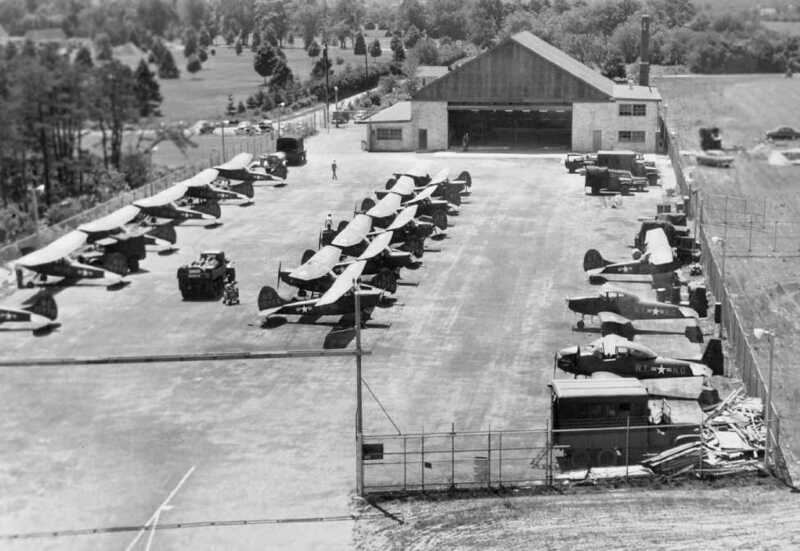 which depicted Islip as an auxiliary airfield. which depicted an open area with several small buildings along the east side. The Islip Speedway began operation in 1947 on the Islip Airport property. 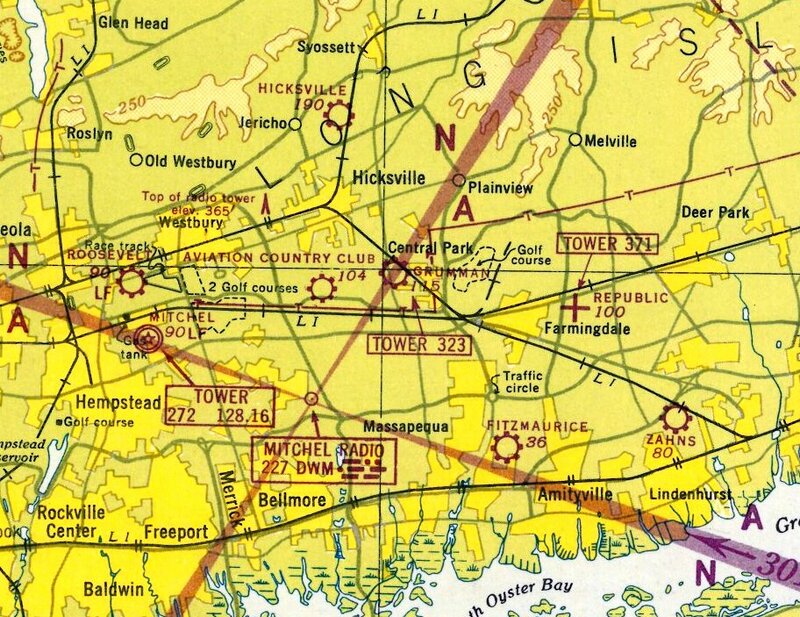 Islip Airport was no longer depicted on the July 1949 NY Sectional Chart (courtesy of Ron Plante). 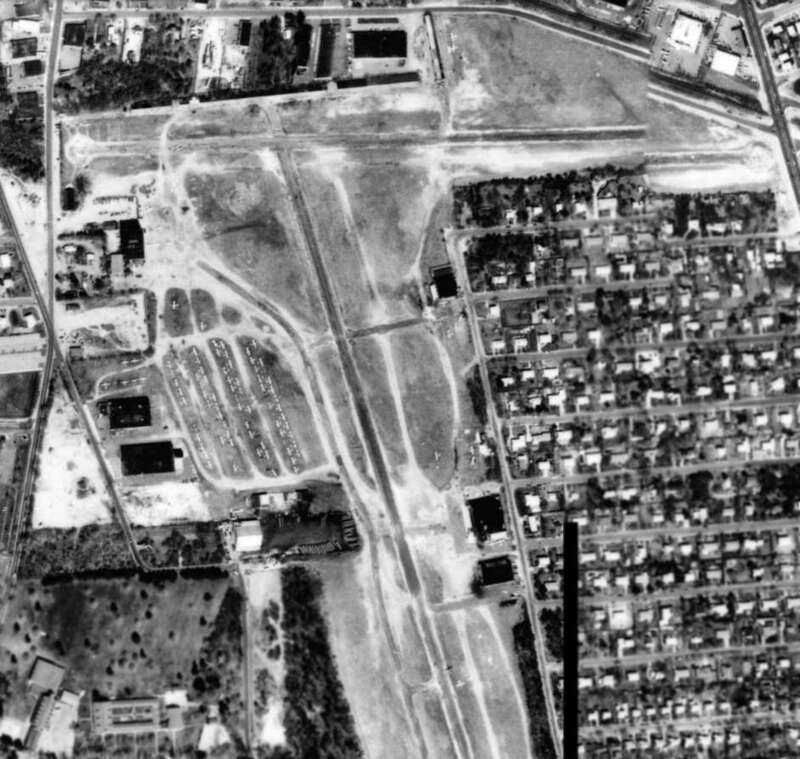 A 1954 aerial photo showed the Speedway has been constructed over the center of the Islip Airport site. But the hangar remained on the eastern side, and the overall airport perimeter remained recognizable. 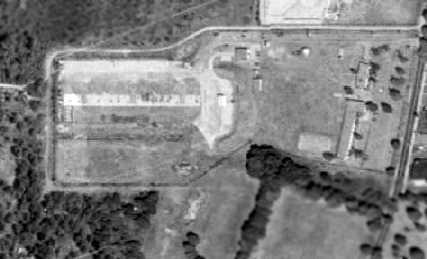 The former hangar remained visible in a 1962 aerial photo. 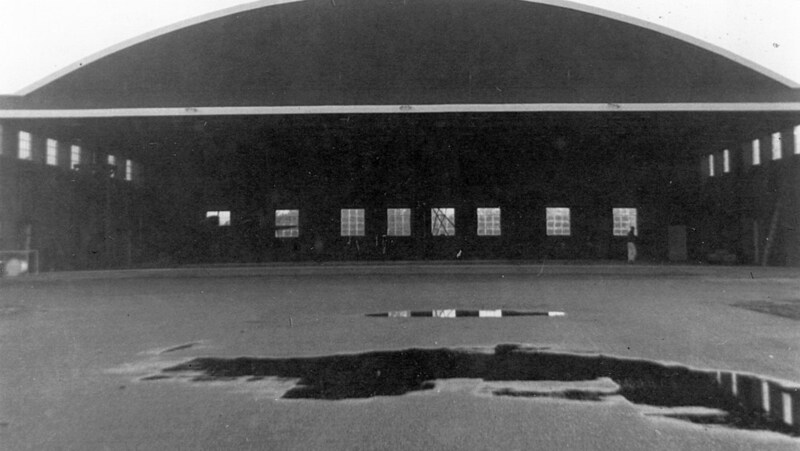 A 1978 aerial photo showed that the former hangar had been removed at some point between 1962-78. The Islip Speedway ended operation in 1984. 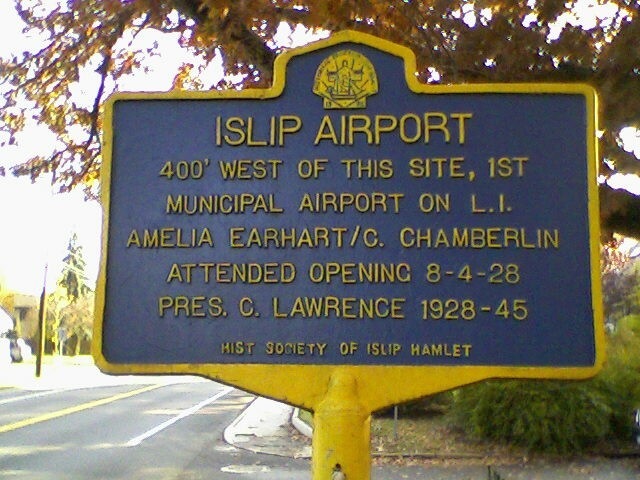 A 2007 photo by Larry Lund of a historical marker commemorating the original Islip Airport. 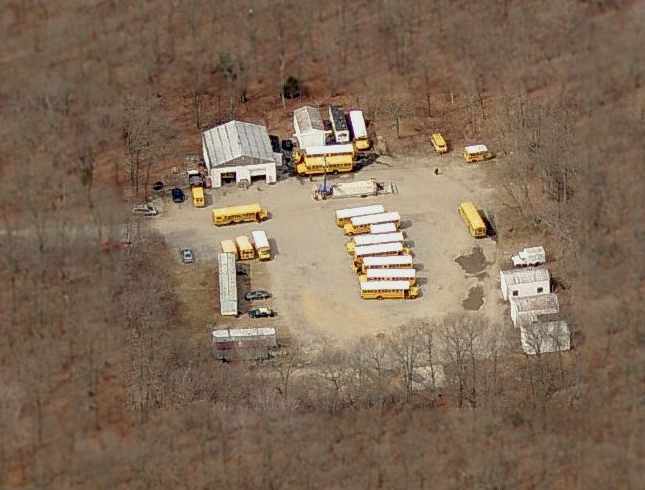 A 3/6/12 aerial photo did not show any remaining trace of the original Islip Airport. 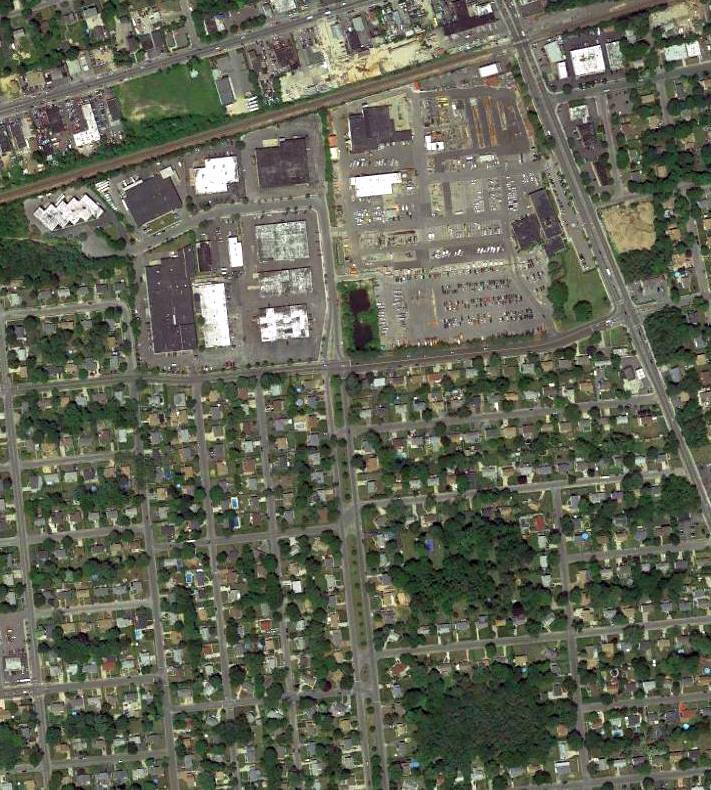 The site of the original Islip Airport is located southeast of the intersection of Freeman Avenue & Spur Drive South. An undated postcard of a Jenny biplane in front of hangars at “Brindley Flying Field”. Originally this installation was to be named Chapman Field after Lt. Col. C. G. Chapman who died while fighting in France. who had just died testing a new plane & was considered at the time to be one of the best pilots. 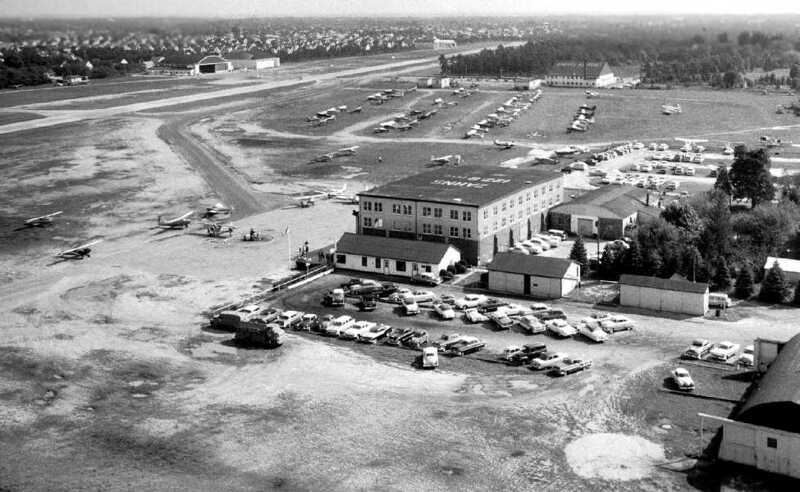 Brindley Field was a satellite field which supported flight training operations at Mitchell Field. It was constructed on the former Randel Farm, and operated for less than one year. “The first thing we knew of Brindley Field, or any activity of it occurring there, was in June 1918. The first sight of any of this activity was a long line of army trucks coming up the old Jericho Turnpike with soldiers in them. To see a truck of any kind was a unique experience in those days. They just didn't exist in Commack. and pulled right into the gates of the property on the north east corner of Jericho Turnpike & Larkfield Avenue. with the buildings, and barns, one large barn, and several other storage barns of a smaller size, and other out buildings. And a main house which they immediately established as a headquarters for the field. From that time on, for the next month or so, the place blossomed out into a tent city. 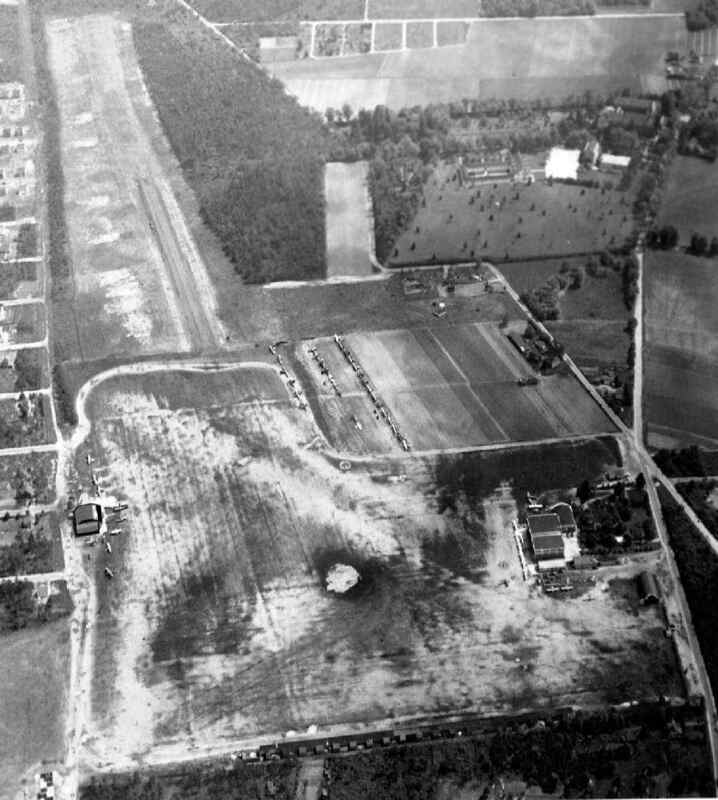 An undated aerial view of Brindley Field. was the mess halls where the soldiers had to go to eat their meals. The next permanent buildings being built were the barracks for the men to sleep in. In the beginning the tent city was used as their sleeping quarters. I also remember the set up of officers tents, and the medical center in a tent. Then about the first of August they built quite a number of barracks. I think all together about 16 or 20 of them all together. They were built along the north side of Jericho. The nearest barrack was just inside the fence line on the pike." Shea continued, “The field was protected every day by guards who would walk the parameter of the field. After July there were no more visitors allowed inside the camp. I had some access in the beginning being a kid, but they gradually phased me out. and was the last training field for flyers before they went to France. It was a very important field at the time & sometimes other planes would fly in for a few days. Shea continued, “Towards the end of that summer they found they needed more space so the rented some more land to the east. In one case they had to condemn the land from the owner, but only temporarily. They did some considerable clearing of woodland in the north east corner of the property. They cleared that area of trees entirely. They cut them down, removed the stumps, and graded it off. the nearest one was about 150 feet from Larkfield Avenue. They stood in a line behind the original hay barn that had been used to hold airplane parts at that time. They were for what we called Jenny planes at the time. They had dogfights in their training over the field & surrounding areas. One of the most serious accidents happened while they were having dogfights over the Havemeyer property east of Townline Road. Two pilots were killed when their plane crashed into the ground after loosing control. because someone had come over to our house & told us that there had been a crash over in east Commack. and that was a mistake because they ran into hedgerows & had to take down fences. But it was no use to save them because they were both killed outright. An undated postcard of unidentified biplanes at Brindley Field. 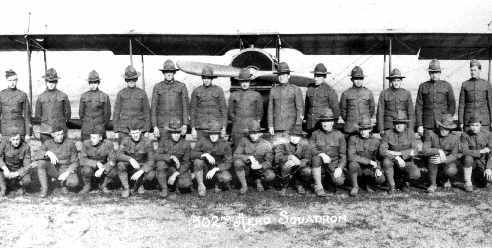 An undated photo of pilots at Brindley Field in front of an unidentified biplane. An undated photo of a biplane (a Jenny?) from Brindley Field which came down in Johnson's field. Operations at Brindley Field ended in May 1919, less than one year after the field was established. 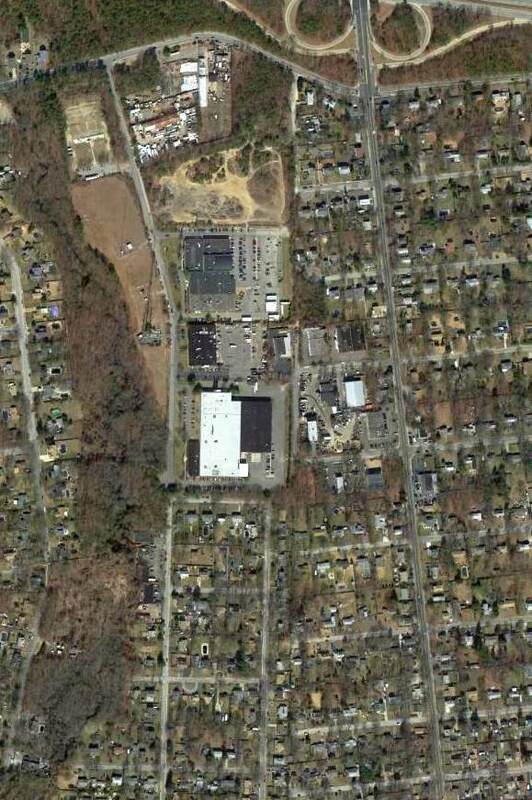 Lorraine Scudder reported, “Brindley Field...my family lived across from it on the south side of Jericho Turnpike. my great-grandmother purchased 2 of the barracks & had them moved across the street. She had one of them converted into house for her. or the 1947 USGS topo map. 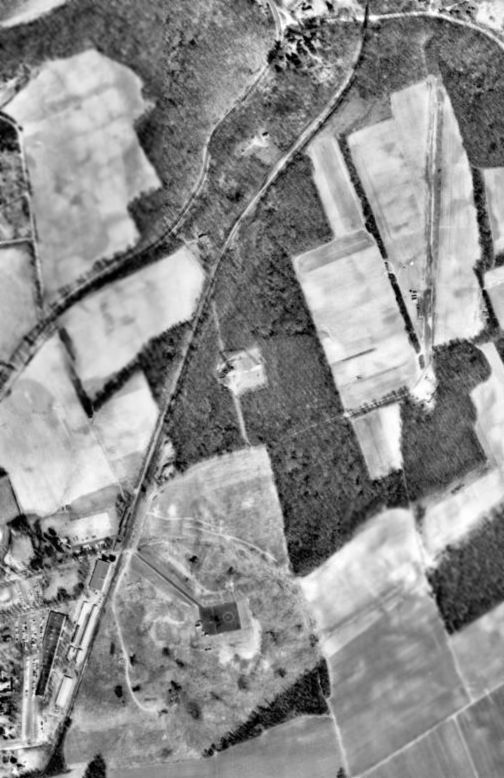 A 1953 aerial photo did not show any recognizable trace of an airfield – just open farm fields. Mark Wilkinson recalled, “I moved to the area in 1961. 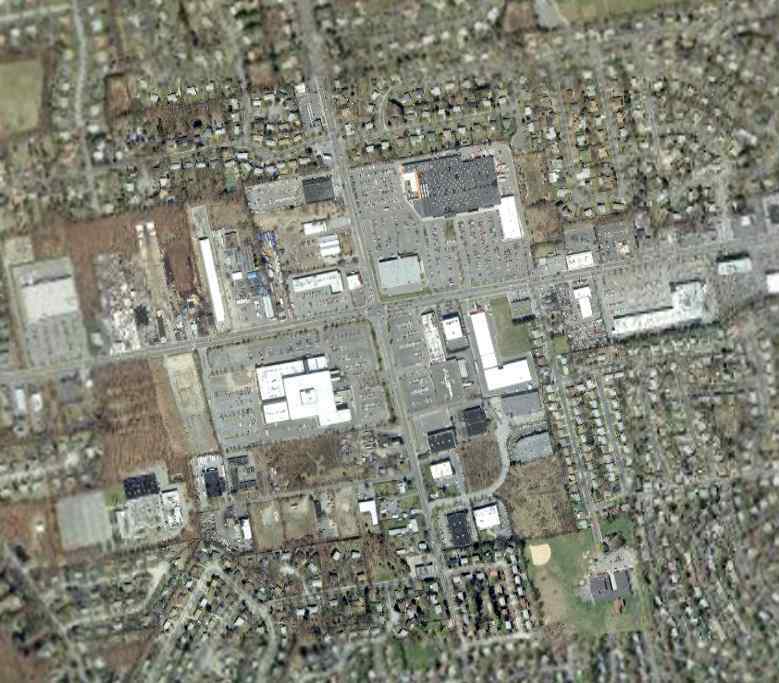 The site of the former airport, the corner of Larkfield Road & Route 25 (Jericho Turnpike), was a farm field at that time. “stayed in the family until my parents sold the house in 1983. I'm pretty sure the current owners don't know this information. I know when my parents sold the house they didn't tell the buyer. 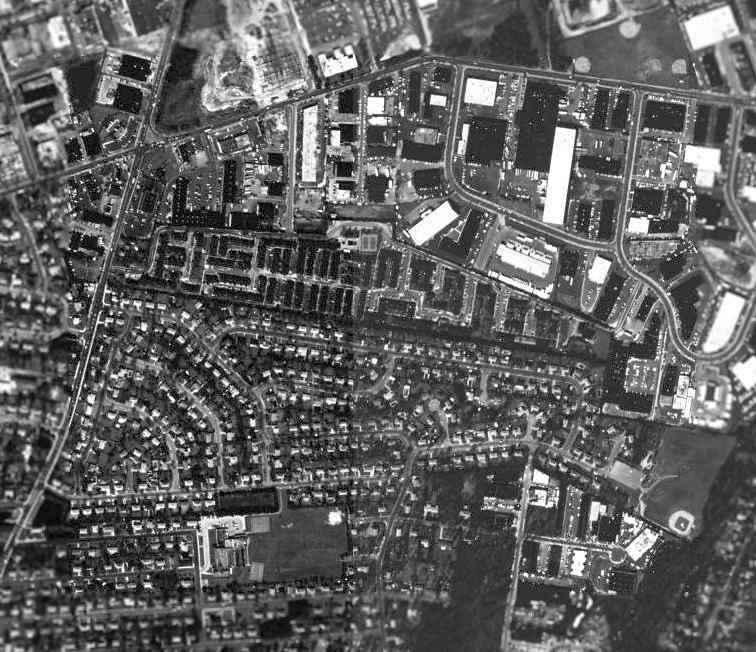 A circa 2000-2005 USGS aerial photo shows no trace remaining of the former Brindley Field. Two 2005 photos by Mark Wilkinson of historical plaques at the site of Brindley Field..
A 1954 aerial photo depicted the single north/south runway at Flowerfield. which developed the first practical unmanned helicopter. (that even operated from the decks of small ships) way back in the 1960s. 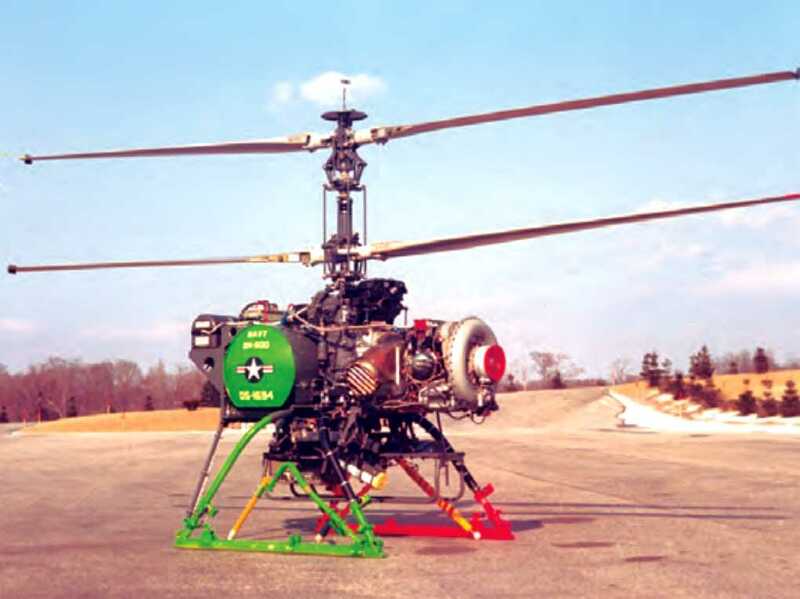 The founder of Gyrodyne, Peter Papadakos, was the pioneer who perfected the American Coaxial helicopter design. Papadakos believed that the coaxial rotor system held the greatest promise. Papadakos spent his entire life working tirelessly promoting his ideal of the "perfect helicopter". (which included the unfinished design of a coaxial helicopter), and founded the Gyrodyne Company of America. and eventually performed demonstrated flights for 7 Air Force pilots. No airfield was yet depicted at this location on the 1947 USGS topo map. 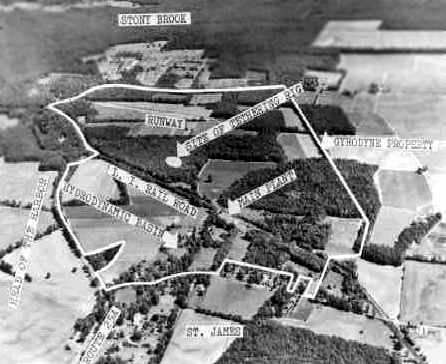 By 7/1/51 enough capital has been raised to acquire a tract of land for the new company in St. James. run by a retired General Motors executive's wife. On the 320 acres that Papadakos acquired for the company, several buildings & 2 homes stood. which was transformed into executive offices, engineering, drafting & machine shop facilities. which provided the company with both a permanent home & a base for future expansion. 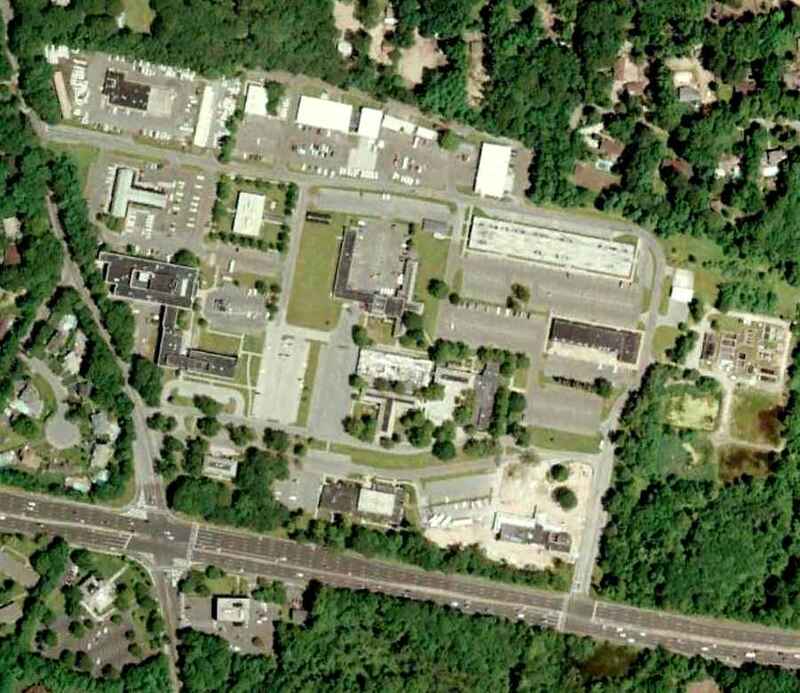 began to perform subcontract work for Long Island's strong defense base. and underwrite the expenses associated with the helicopter development. Most of the 50 or so part-time employees working for this small start-up were paid in Gyrodyne stock. A machinist made $5 / hour, which translated to 1 share of common stock / hour. was his best chance of holding onto his quality machinists & engineers which were in high demand at the time. 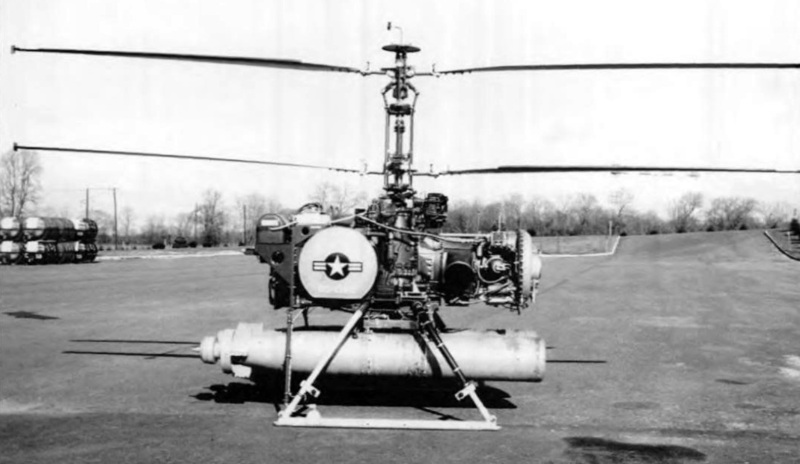 In 1951, Papadakos sought a better way to control the Model 2B compound helicopter. He knew he had to modify the airframe, but did not want to take his only flying aircraft apart. One evening, a group of engineers gathered at the company's new facilities at Flowerfield. all without Mr. Papadakos' knowledge. Needless to say, many stressful days soon followed! His Gyrodyne crew soon modified the model 2B by also removing the 2 side engines. Also added were movable tail surfaces, power boost controls & other minor improvements. to accumulate & submit flight test data pertaining to the coaxial configuration. The scope of the contract was to record the flying qualities of the coaxial configuration. The resultant Model 2C was instrumented for the flight test program. The instrumentation package included an oscillograph & a photo panel. The flight test program was completed & final report submitted by December 1952. This was the first documentation of flying qualities of a coaxial rotor helicopter in the US. 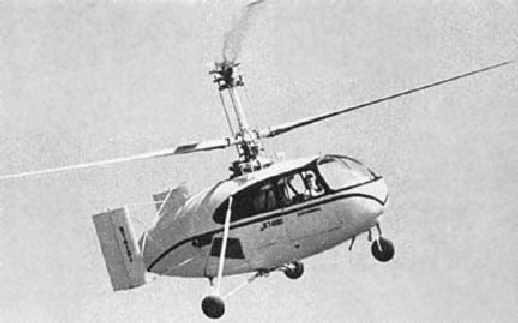 An undated photo of the sole Gyrodyne GCA2 (N74101), a 5 passenger compound helicopter which first flew in 1951. Movable vertical surfaces (rudders) & differential collective in the rotors were incorporated for yaw of the flight test. where the yaw control means proved inadequate. In order to overcome this difficulty, Gyrodyne continued its research work toward improving the directional control characteristics. In March of 1953, the idea of using tip brakes on the tips of the rotor blades was conceived. Flight tests of this concept proved that the problem of effective yaw control in autorotation for a coaxial helicopter had been solved. This was a major breakthrough for the coaxial configuration, and the company was granted a patent for this configuration. The tip brake "made the coaxial possible", Mr. Papadakos was to later state. the XRON Rotorcycle contract was awarded & Gyrodyne was on its way to becoming a major defense contractor. thus creating the QH-50A (later known as the DASH). The earliest depiction of the Flowerfield Airfield which has been located was a 1954 aerial photo. It depicted the single north/south runway, which appeared to be the only aviation facility at the site at that time. 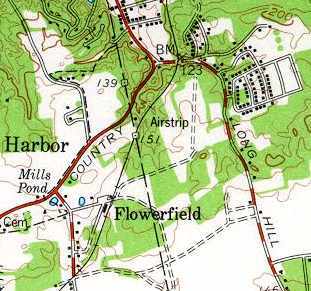 The Flowerfield Airfield was depicted (but labeled only as "Airstrip") on the 1956 USGS topo map. It depicted Flowerfield as having a single 1,900' runway, oriented north/south. 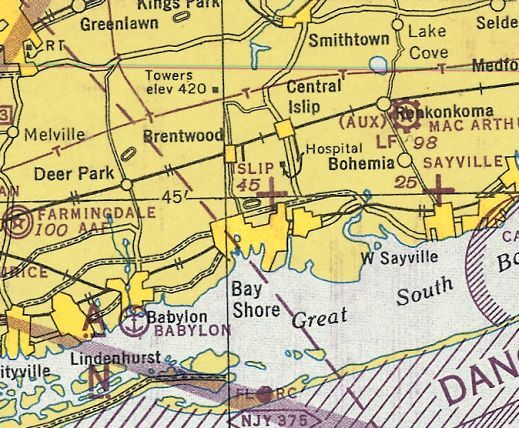 No airfield at this location was depicted on the 1957 NY Sectional Chart (courtesy of Mike Keefe) or subsequent Sectional Charts. 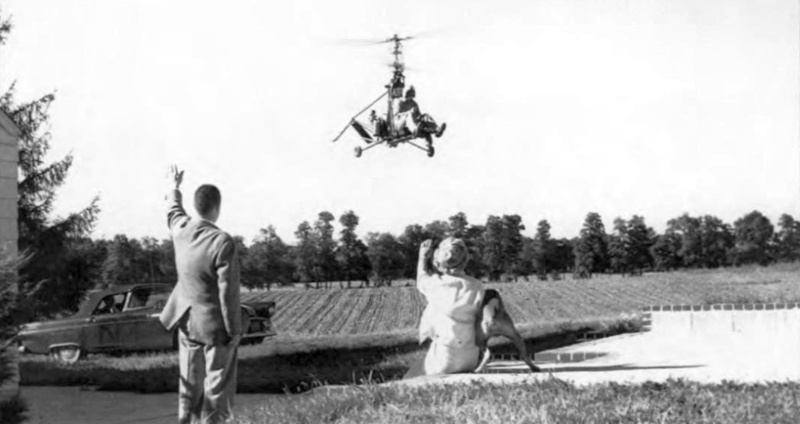 A 1960 photo of Gyrodyne's XRON 1-man reconnaissance helicopter flying over Flowerfield. 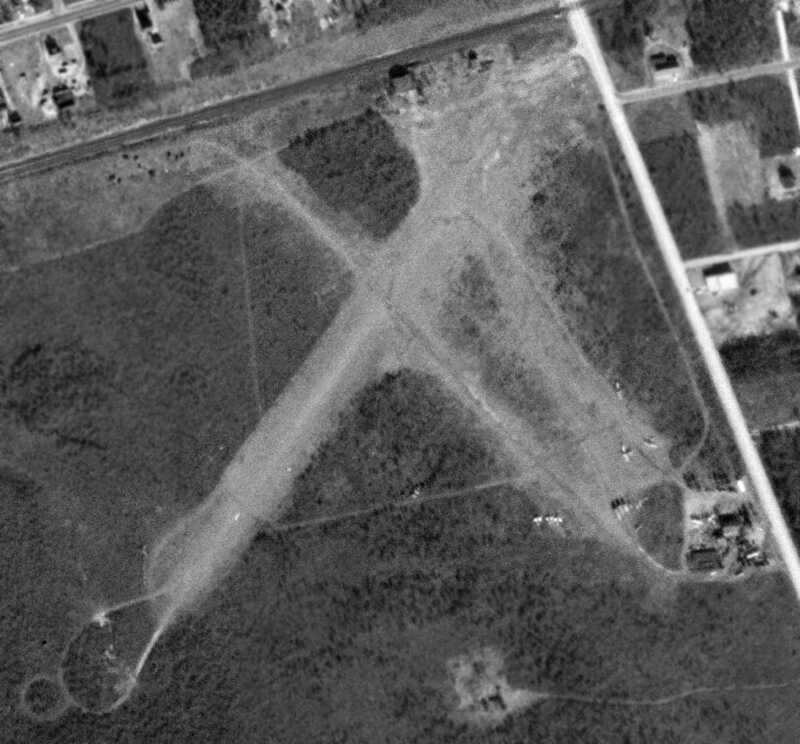 A 1961 aerial photo showed that a tethering rig had been added at some point between 1954-61 just southwest of the runway. and the Gyrodyne company plant buildings at the southwest corner. A circa 1960s aerial view looking northeast at the Flowerfield Airfield of the Gyrodyne Company (courtesy of Jos Heyman). and a "hydrodynamic basin" on the opposite (western) side of the railroad, across from the manufacturing plant. By 1963, Gyrodyne had over 700 employees & many stationed all around the world to support the U.S. Navy's DASH weapon system. However, Mr. Papadakos, still maintained the position as "head of marketing"
and speak with them of his company's coaxial helicopters & their benefits. major visits by the head Navy personnel increased dramatically by 1961. 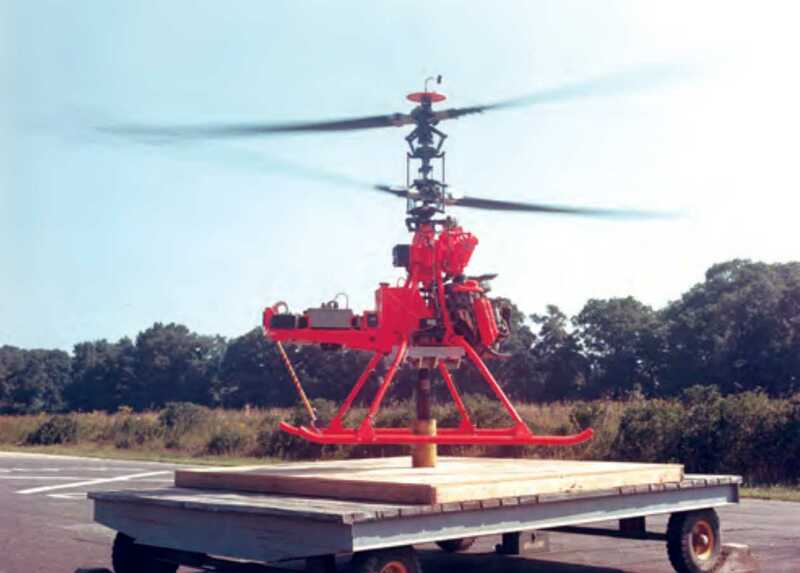 A 1965 photo of a DSN-1 (QH-50A) on a Gyrodyne Flowerfield hover fixture. A circa 1960s photo of DS-1694, a QH-50D with the Snoopy sensor package, at Gyrodyne Flowerfield before it was deployed to Vietnam. and an amazing engineering achievement for such a small independent company, particularly way back in the 1960s. The QH-50 was powered by a single small turbine engine, which turned 2 contrarotating main rotor blades. It was capable of operating off of the very small helicopter deck of Gearing-class destroyers, even in open sea conditions. by delivering a payload of 2 homing torpedoes onto a submarine target detected by the destroyer. Mr. Papadakos' life was centered on his evolving company. had accepted the idea that manned flight off destroyers was best left to expendable drones, but that was not to last. While the QH-50C's enemy was that of the undersea "red menace"
as those DASH equipped ships began to reach their limit of their operational lifetime. Yet DASH was not being installed on the new destroyers joining the Navy. and designed around the new LAMPS (Light Airborne Multi-Mission-Purpose-Ship based) concept helicopters. Suddenly, the Navy had more QH-50s than it needed, and by 8/29/69 the last Navy QH-50D had been delivered. and parts demand for the meticulous Japanese mechanics was not as strong as it had been for the U.S. Navy. looked as if they had just come from the assembly line; they were so well maintained! Mr. Papadakos had seen this end coming & had positioned the company to possibly having to survive with little or no government defense work. for the purpose for holding certain assets of the company's property. A circa 1968 photo of the world's first armed drone helicopter: a Gyrodyne QH-50 armed with 2 torpedoes, at the Flowerfield test site. along with a large paved area that may have been related to flight tests. During this time, however, Papadakos continued to try & convince the Department of Defense of the value of the coaxial rotor system. In 1969, the Allison powered QH-50E had flown. In 1970, the 2-stage transmission equipped 24' rotor system had successfully been flown. That aircraft, with a slower rotor RPM of 570, allowed for greater speed & a payload of close to 2,000 pounds. to enter the Heavy Lift Helicopter (HLH) competition. from all the helicopter companies to cancel the program. That was the final request for proposal Gyrodyne ever responded to. Papadakos felt that to place his company at risk on the whimsical needs of the military no longer justified the risks. so that what parts support & transmission overhauls required could occur. and subdividing them into small suites in order to turn the property into an industrial park. to examine the use of the QH-50E as a modern surveillance drone with modern electronics. Dornier took their interest much further. In the Summer of 1986, Dornier sent a 3 person team to learn all they could about the QH-50D. After dismantling one aircraft for inspection & then reassembling it, Dornier flew the aircraft on a hovering fixture on 10/16/86. This had been quite an effort for Mr. Papadakos, who at age 72, found himself working long hours as a Program manager yet again. whom after 17 years since the assembly line had shut down, were physically able to do the work. to integrate their digital auto-pilot & other modifications for their GEAMOS program. In the spring of 1987, Mr. Papadakos received visitors from the Naval Air Warfare Center, China Lake, CA. The QH-50D was still in use by the Navy as a target for anti-helicopter missiles. The Navy needed rotor blades for those aircraft & requested a bid to have blades made. Papadakos put a bid on the cost of finding personnel from the production days when Gyrodyne made their own blades. but which Gyrodyne had stored for the Navy for safe-keeping. In the fall of 1987, those helicopter assets left with many of the Rotorcycles going to museums & schools (which wanted the Porsche engines for shop classes). From 1988-91, Papadakos spent his time assisting Dornier with their drone development. like it had been during the DASH days. that had been part of the largest Unmanned Aerial Vehicle program in the world. 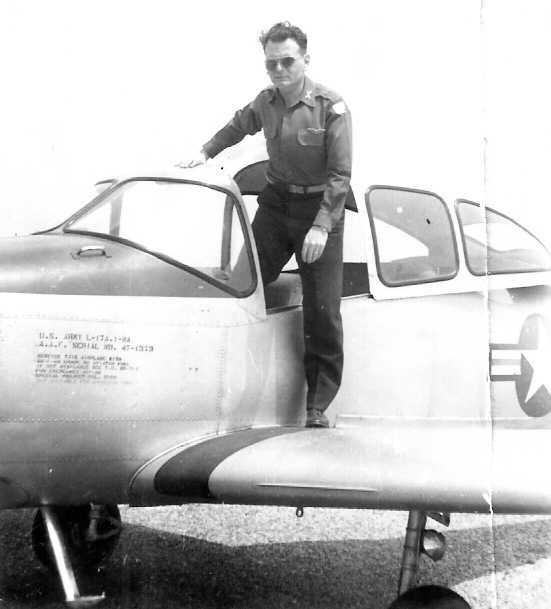 Papadakos kept working on advancing his aircraft's role in the world until he died on 5/26/92. As seen in the 4/8/94 USGS aerial photo, the single north/south runway remained intact at Flowerfield. and the former Gyrodyne company plant buildings are at the southwest corner. Mr. Papadakos' death left many tasks uncompleted. By 1995, Gyrodyne was producing 60 plus rotor blades for the Navy - a contract worth over $ 1.4 million. for their Allison engine powered SEAMOS maritime surveillance drone. in which the personnel who had created those assets, had simply passed away. to support the U.S. military users of the QH-50. to focus on the Company's primary asset - the 326 acre Flowerfield property." and placed within the company in Los Angeles, called Gyrodyne-CA. the Company was expected to realize proceeds of approximately $400,000. the design & manufacturing of helicopters for military use primarily during the 1950 & 1960s", Maroney said. but its primary focus has become the redevelopment of the Flowerfield property (a total of 314 acres). Five former Gyrodyne buildings (Buildings 1, 2, 7, 8, and 17) have been leased to other tenants for light industrial uses. 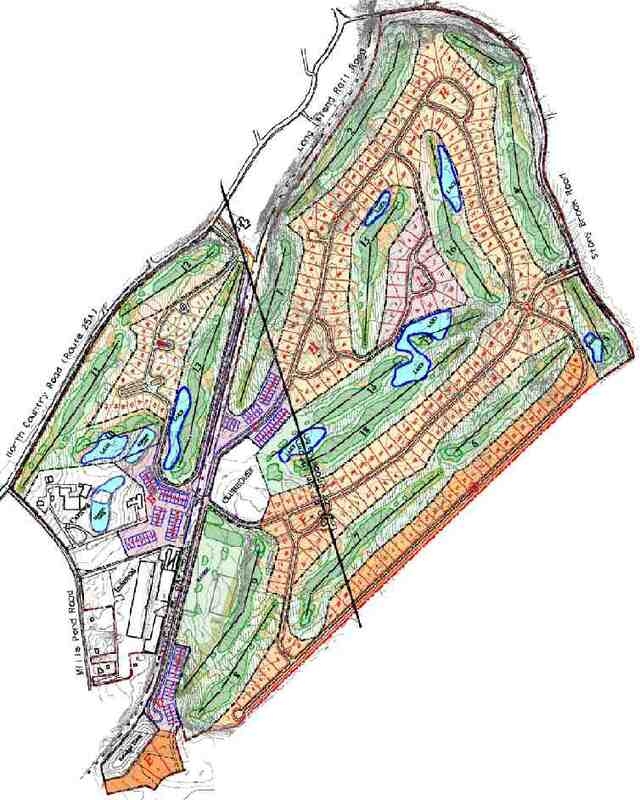 However, the primary intended use for the Flowerfield property is to transform it into as golf course. A 4/4/04 aerial view depicted the Flowerfield runway in largely the same manner as seen in 1994.
into a private community with an 18-hole championship golf course & 336 luxury residential units. 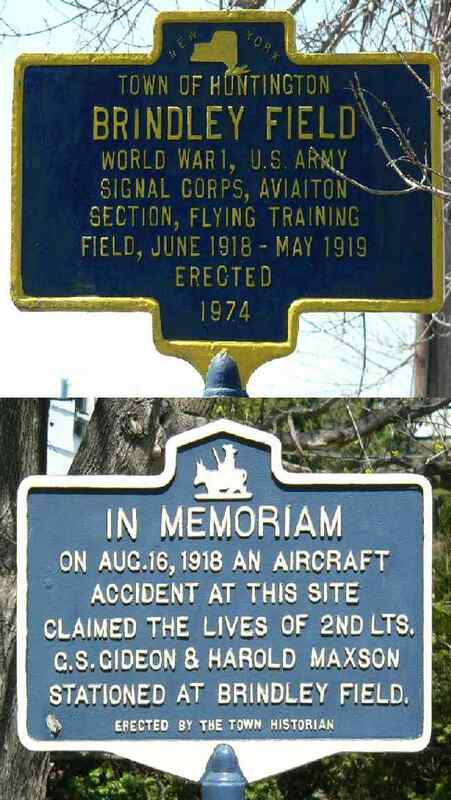 that seems to be a common fate for so many of our country's historic airfields. A circa 2006 aerial view looking west at the former Flowerfield tethering pad (previously used for helicopter flight tests). According to Keith, “The big building on the far side of the pic of the tethering pad was” dates from before 1973. A circa 2006 aerial view looking west at the former Flowerfield runway. According to Keith, this was added at some point after 1985.
and much of the former runway pavement had faded (or been removed). A 3/31/07 aerial view showed that construction had begun on a building on the east side of the former runway. erasing the last sign of this little former airfield which occupied an interesting place in American military aviation technological development. The site of Flowerfield is located northwest of the intersection of Mills Pond Road & Parkside Avenue. Thanks to Jos Heyman (of Australia) for pointing out this airfield. 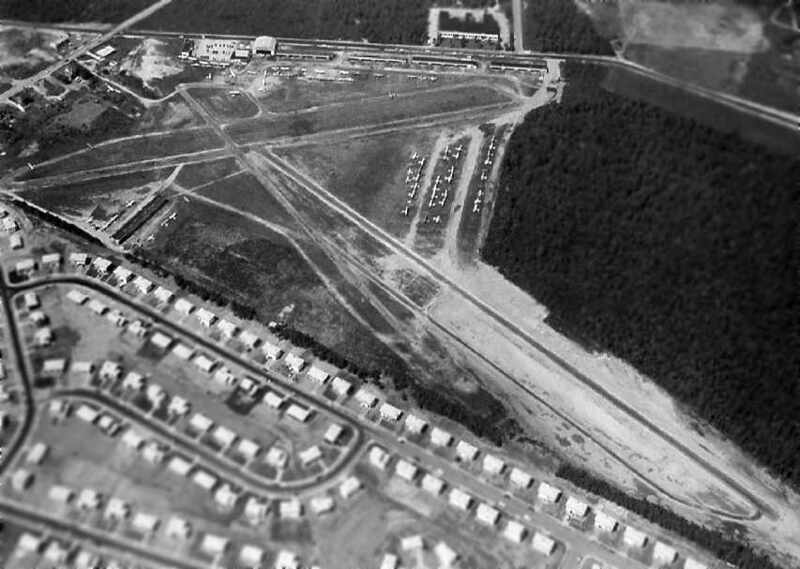 A 1947 aerial view of Smithtown Airport (courtesy of Jim Daly). The earliest depiction which has been located of the Smithtown Airport was a 1947 aerial view (courtesy of Jim Daly). 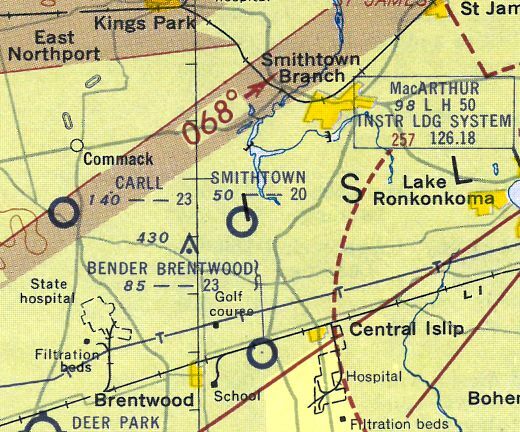 It depicted Smithtown as having a single unpaved northwest/southeast runway. There were no hangars or buildings associated with the airfield, but there was one single-engine aircraft on the southeast runway end. the January 1949 NY Sectional Chart (according to Chris Kennedy), or the 1950 NY Sectional Chart (courtesy of Mike Keefe). 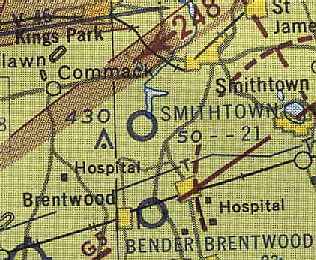 Smithtown may have been omitted from the charts, as a relatively small airfield. which they had sold due to rising property values. being readily adjacent to the new Northern State Parkway Extension." and so with only 50 members paying $3,200 a year, the club could take to the air again. The members, however, had lost interest, and that August, 90% voted to dissolve the club forever. Chris Bobka recalled, “I do remember the Smithtown Airport. I remember it from the earliest days of my airport bumming. I may have been in diapers... As my parents moved to Huntington in 1952.
and that a horse stable where my older sister would go to rent horses was quite close by. 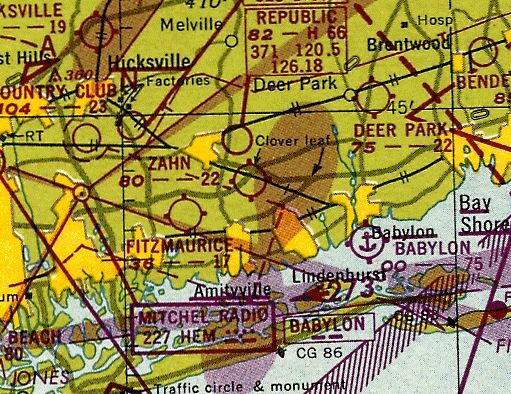 was on the 1953 NY Terminal Aeronautical Chart (courtesy of Tim Zukas). 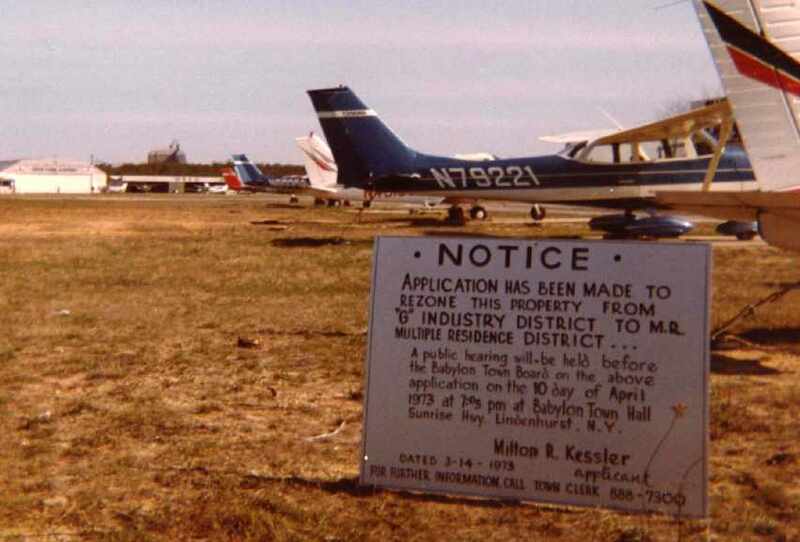 It depicted Smithtown as having a 2,000' unpaved runway. depicted Smithtown Airport as an open grass area with several buildings on the north & east sides of the field. A 1954 aerial view depicted Smithtown as having 2 grass runways, with several hangars on the north & east sides of the field. 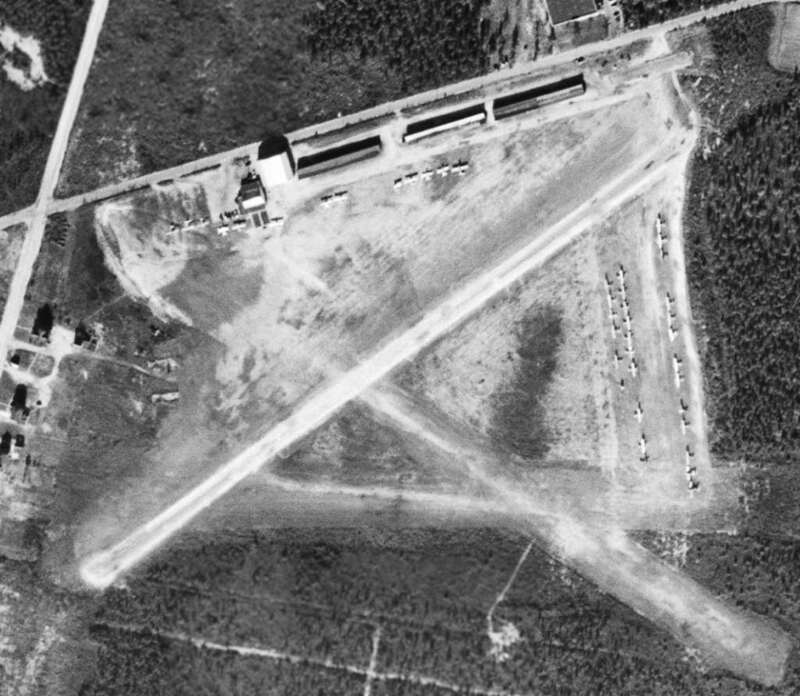 A closeup from the 1954 aerial photo depicted a total of 10 light aircraft visible parked outdoors at the Smithtown Airport. with the longest being a 2,100' turf strip. 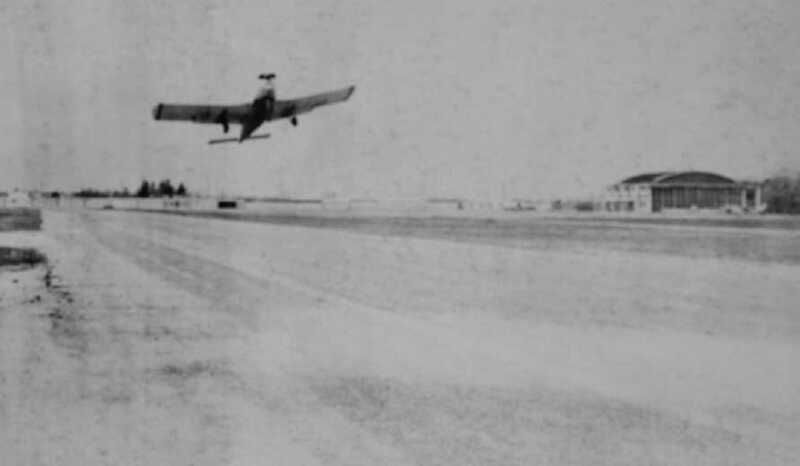 showing large numbers of cars parked on the runway for the annual Republic Aviation picnic in 1955. 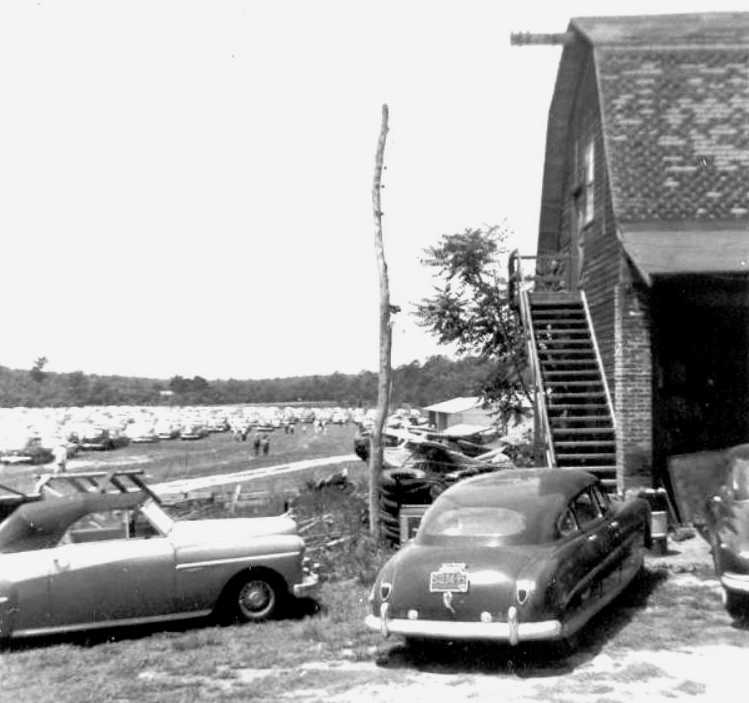 Note the barn used as a hangar, and several aircraft parked behind it. 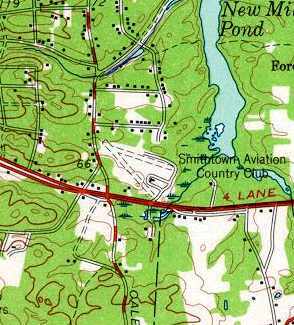 The 1956 USGS topo map depicted the "Smithtown Aviation Country Club"
as having two 2,000' unpaved runways, oriented southeast/northwest & east-southeast/west-southwest. A single building was depicted on the east side of the field, in between the 2 runways. as it was no longer depicted on the 1957 NY Sectional Chart (courtesy of Mike Keefe) or subsequent Sectional Charts. but 2 former hangars still remained standing on the north side of the site. 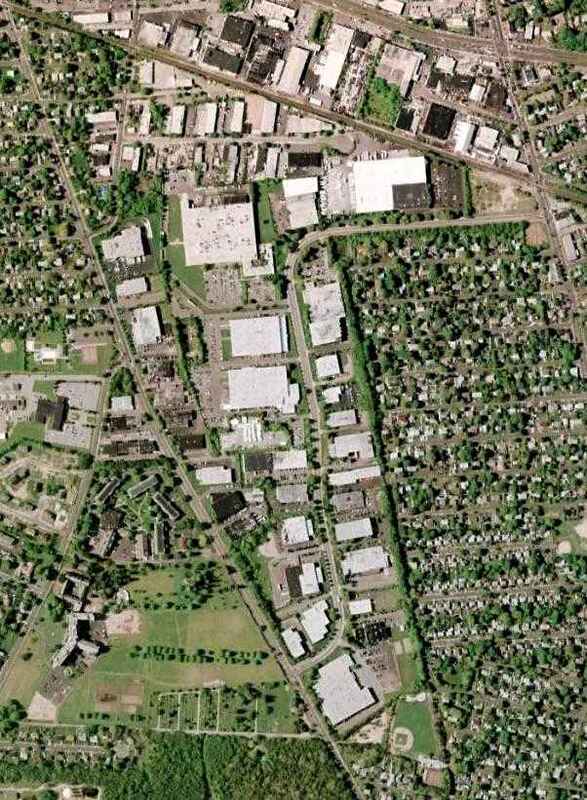 The 1992 USGS topo map labeled the group of buildings occupying the site of the former airport as the "County Center". the 2nd & 4th buildings from the left. Ironically, the location still has some aviation use, as a helipad is visible on the left (but there is no heliport listed at this location as of 2008). 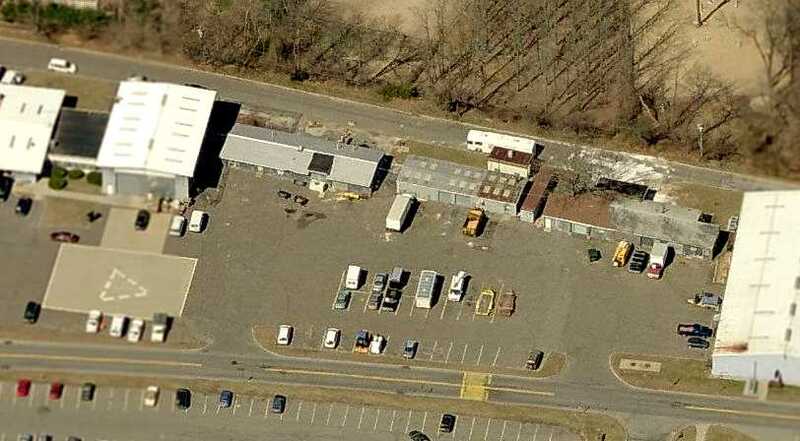 A 5/4/09 aerial photo shows the buildings covering the site of the former airport. northeast of the intersection of Route 347 & Old Willets Path. 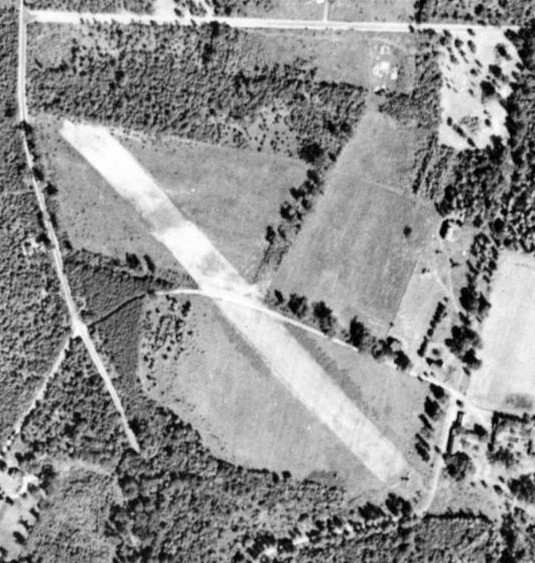 A 10/5/41 aerial view looking northeast at Zahn's Airport. only a half-mile southeast of Republic Airport. Joe Zahn first cut a 1,200' airstrip into part of his apple orchard in 1936. 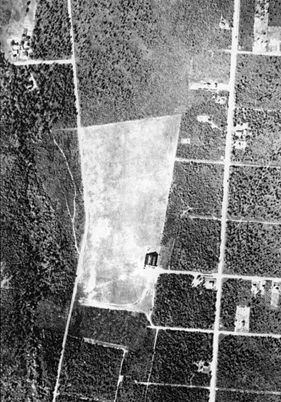 The earliest depiction which has been located of Zahn's Airport was a 10/5/41 aerial view looking northeast. with 2 single-engine aircraft parked near a few small buildings on the southwest side of the field. when the land of the airstrip was returned to cultivation to help boost food production for the war effort. 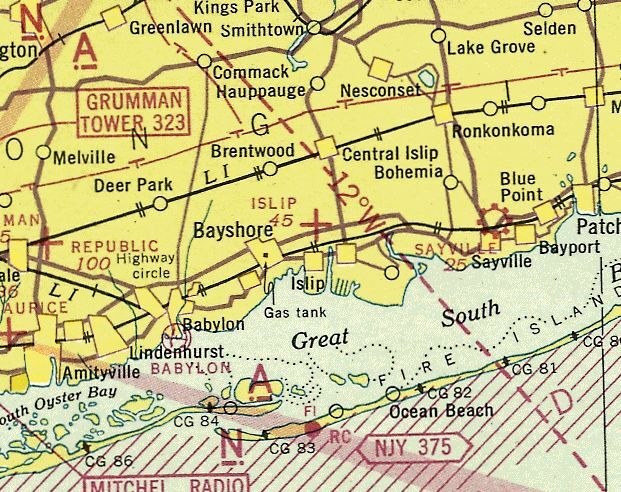 No airfield at this location was yet depicted on the November 1942 NY Sectional Chart (courtesy of Ron Plante). and saw an opportunity to start a flying school on Long Island. He leased land on Zahn's farm in 1945. Ed made a deal to rent an empty tool house adjacent to Zahn's strip in order to start a flying school. 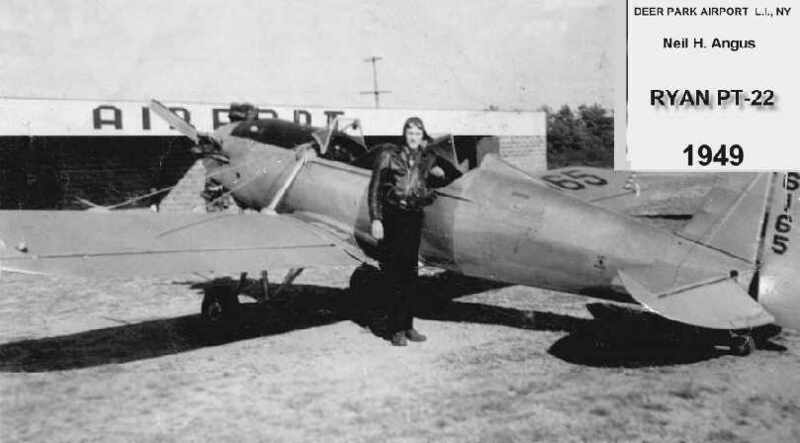 Ed began teaching with a surplus Canadian Fleet trainer & a 45 horsepower Piper. With GI money available for education for ex-servicemen, Ed soon had many students. Students paid $10/hr for instruction, and the business boomed. Ed established Amityville Flying Service & looked for other partners. Zahn became a partner & set aside 840 acres to establish Zahn's Airport. Don Brzezinski recalled, “In 1946 I took flying lessons at Zahn's on the GI bill. Zahn, Looney, Hoffman, had their flying school one side of the airport, Lyons flying service on the other. Ed Lyons (real name Ed Liebowitz) flew during the war in Spain as a fighter pilot. Ed Lyons was a Colonel in the Civil Air Patrol. 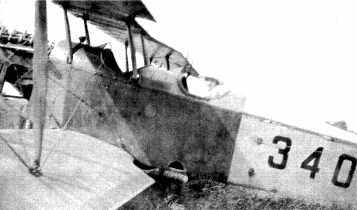 His aircraft were Piper J3s - yellow with a lion's head on the side. There was only grass for the field runways & they were a different orientation than in later years. The left-hand pattern intersected with Republic Airport's right-hand one. This made a very interesting approach, either a Seabee, the Rainbow or some other military traffic going your way. No traffic control at Zahn's - just landing aircraft on the final had the right-of-way. Zahn's had the only hangar, the fueling was run by Weber (a former B-29 pilot). which depicted Zahns as a commercial/municipal airport. almost all of which are long-gone. The July 1949 NY Sectional Chart (courtesy of Ron Plante) depicted Zahn's Airport as having a 2,200' unpaved runway. Walker Hoffman began a second flying school on the opposite side of the field. The 2 flight schools eventually merged in 1950. Zahn was bought out in 1950 by Ed Lyons, Jack Looney, and Walter Hoffman. The business expanded, and Zahn's Airport became at the time the largest privately airport in America. It eventually grew into the region's largest general aviation airport, with more than 200 resident aircraft & helicopters. 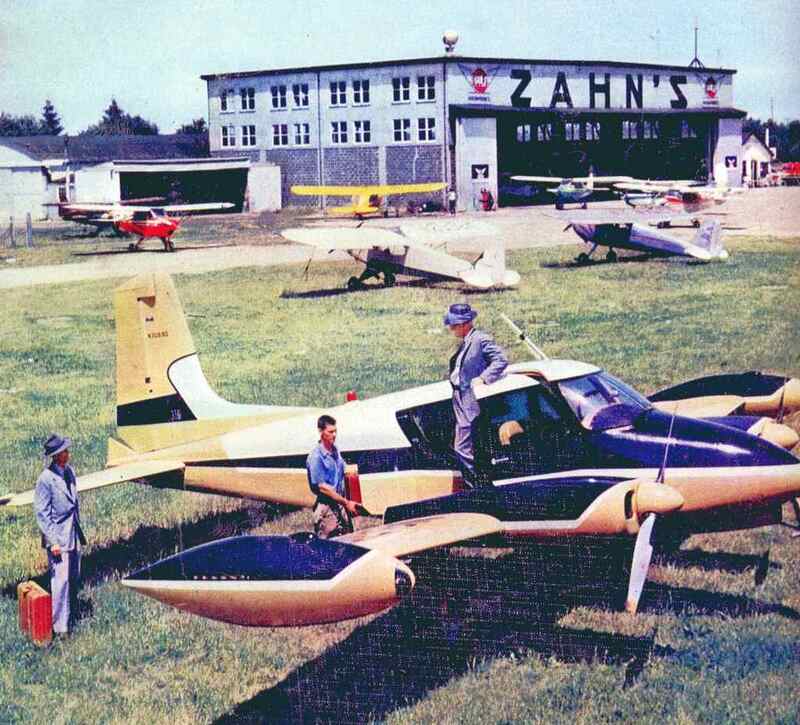 With the closure of Roosevelt Field in 1951, Zahn's became the busiest general aviation airport in NY State. showing a Piper Tri-Pacer & 3 Cubs. A 1951 aerial view looking south depicted Zahn's Airport as having several grass runways, with several hangars on the northwest & northeast sides of the field. Dozens of light aircraft were visible on the field. and checked out in a Piper J-3 Cub (NC42859). I'd rented Cubs at other airports so the flight check consisted of making a few wheel landings for 30 minutes of total flight time. Then I rented the Cub & flew it solo for 1:45 just doing wheel landings, not 3-point landings. all in preparation to flying Lyons Flying Service Mooney Mite, which is a single-seat aircraft. and then took off & practiced 90, 180 & 720 degree turns, stalls & various other air-work for 35 minutes. 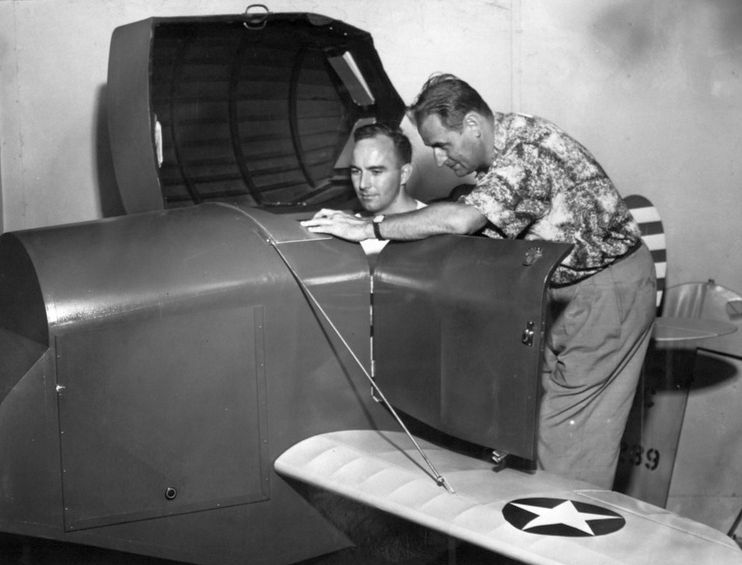 A circa 1950s photo of long-time Zahns flight instructor Bob Havecker teaching a flight student in a Link trainer (courtesy of Steve Moddle). 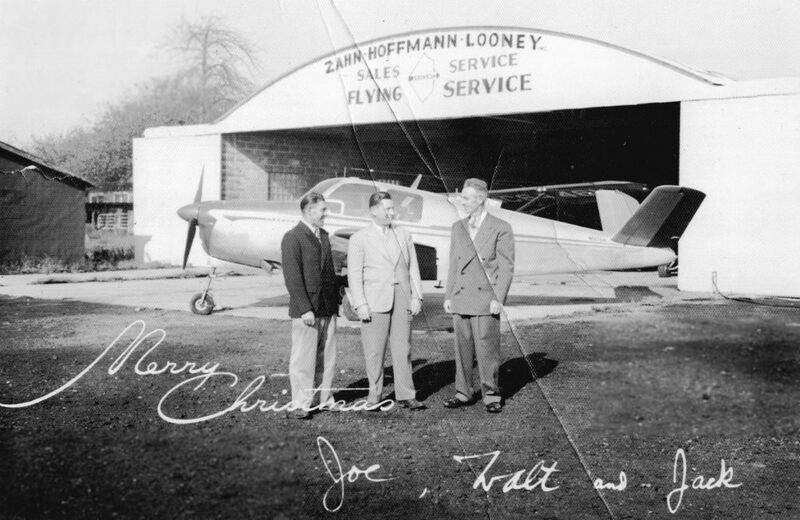 A circa 1950s Christmas photo of Joe Zahn, Walt Hoffman & Jac Looney in front of a Beech Bonanza & their hangar (courtesy of Steve Moddle). The "Whitney Hangar" was located approximately halfway down the east side of the north/south runway. The hangar was built to house the DC-3 of John Hay Whitney, but also hangared other corporate aircraft. An 11/6/51 photo of John Schaefer in the cockpit of a single-seat Mooney Mite from Lyons Flying Service at Zahn's Airport. and the Twin Beech in which the Levitt brothers commuted to the PA where they were building Pennsylvania's Levittown. Ed Lyons, Jack Looney, Walter Hoffman, and Joe Zahn. which was described as "handling DC-3s with ease." The airfield had a total of 35 T-hangars & 2 larger concrete hangars. as was a 3,000' east/west runway & runway lights. and it had a new hangar under construction for 10 helicopters which were planned to be based at Zahn's. As of 1953, there were 3 flying clubs based at Zahn's, as well as a unit of the Civil Air Patrol. A 1953 aerial photo depicted over 52 light aircraft visible parked outside at Zahn's. with several hangars on the west & east sides of the field. A circa 1950s advertisement for Zahns Airport. Charles Spence recalled of Zahns: “I learned to fly there in 1954. Ed Lyons gave me my private flight examination, making me spin the J-3. I later moved up to a Tri-Pacer & then flew a Comanche from there. An ADF approach could be made from the signal on Mitchell Field to the West near Hempstead. On a good Sunday afternoon it was not unusual to be 8th or 10th on downwind with every mix from J-3s to twins. showing 17 Cessna L-19s & 2 North American L-17 Navions. The 1954 USGS topo map depicted Zahn's as having 2 runways & several buildings scattered around the sides of the field. Edward Materson recalled of Zahns, “I took a few lessons back in the 1950s. close to the ground on the final approach. during filming of the 1957 aviation classic 'The Spirit of St. Louis' starring Jimmy Stewart as Charles Lindbergh. as having a 4,200' paved runway. 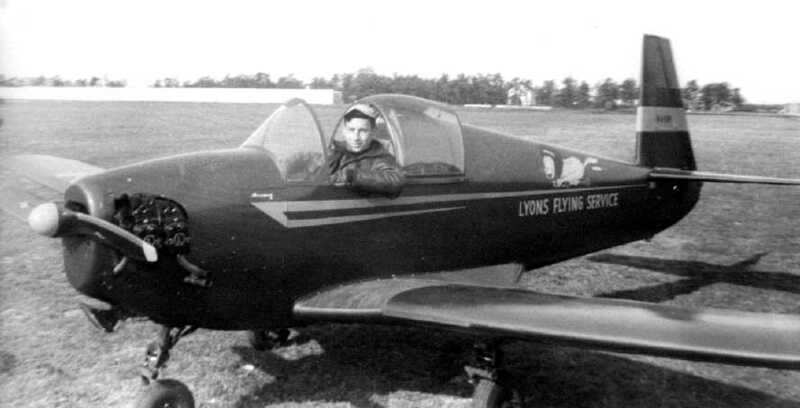 A circa 1950s-63 photo of John Fuchs in a National Guard L-17 Navion at Zahn's Airport (courtesy of William Fuchs). air operations at Zahns during the 1950's until his retirement in April 1963. Most of the aircraft were L-19 Bird Dogs; 1 or 2 L-20 Beavers & an L-17 Navion. running from a open area in front of the hangar to a gate that opened on to the taxiway on the west side of the north-south runway. 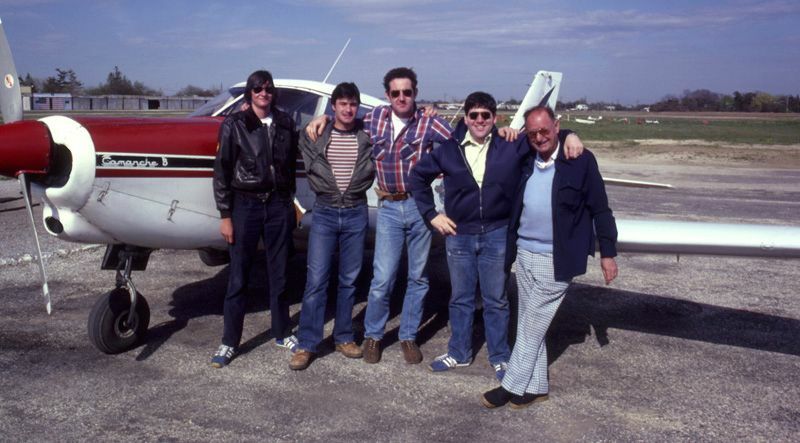 showing Ed Ferner & a Cessna 310 in front of the Zahn's hangar. showing 5 large hangars & a large number of general aviation aircraft. According to William Fuchs, “The hangar in the background at the top right center is the Army facility. 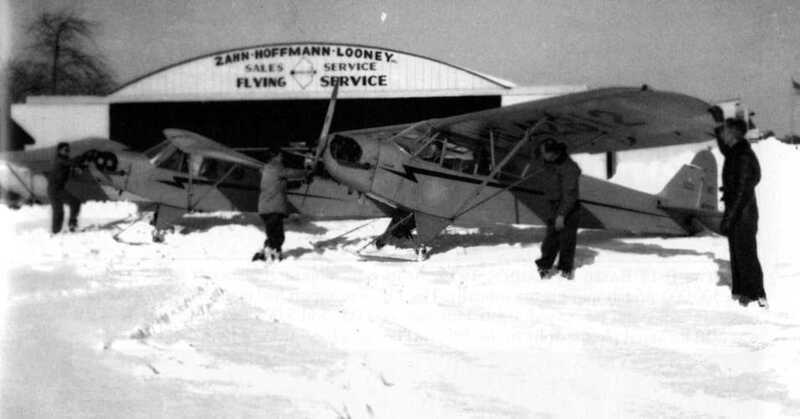 A 1960 photo of 3 Piper Cubs (with 2 on skis) in front of the Zahn-Hoffman-Looney Flying Service hangar. 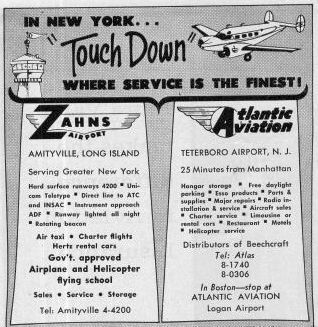 and the operators listed as Amityville Flying Service & Uyldert Flying Service. The Piper Cubs of Amityville Flying Service were known to their students as the "Amityville Horrors"! 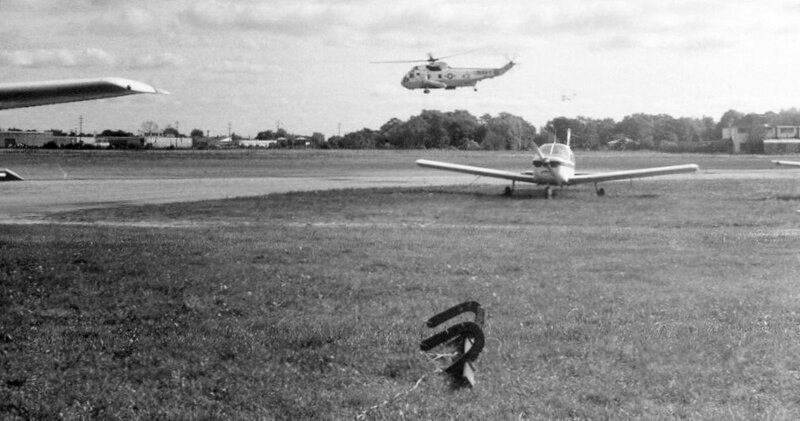 Banner towing flights were conducted from Zanh's, using J-3 Cubs. A 1963 photo by Steve Dobin (courtesy of Chris Bobka) of Chris's “1961 Cessna 150A N7051X at Zahn's Airport. 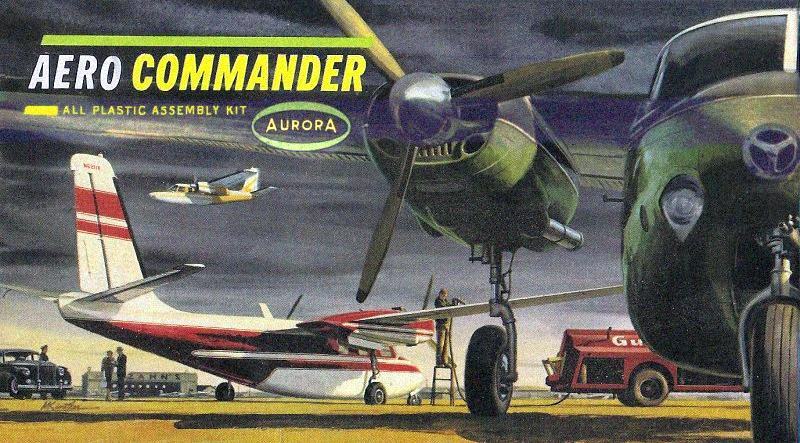 A circa 1960s cover of an Aurora plastic model of the Aero Commander featured the Zahn's hangar in the background. Mike Machat observed, "This scene is dead accurate. Those aircraft were actually based there & the local gas service was indeed Gulf for as long as the airport existed. The green & black Aero Commander 560F shown in the foreground belonged to a very cool guy named Stan. His hangar was located directly across the field from the flight school & he used the plane for private charter & aerial ambulance work. while rushing to launch for yet another emergency aeromedical mission. A circa 1960s photo of a Navy SH-3 Sea King helicopter visiting Zahn's (for what purpose?). Mike Machat recalled of Zahn's Airport, “I worked there as a Line Boy & then took lessons before enlisting in the Air Force in 1967. 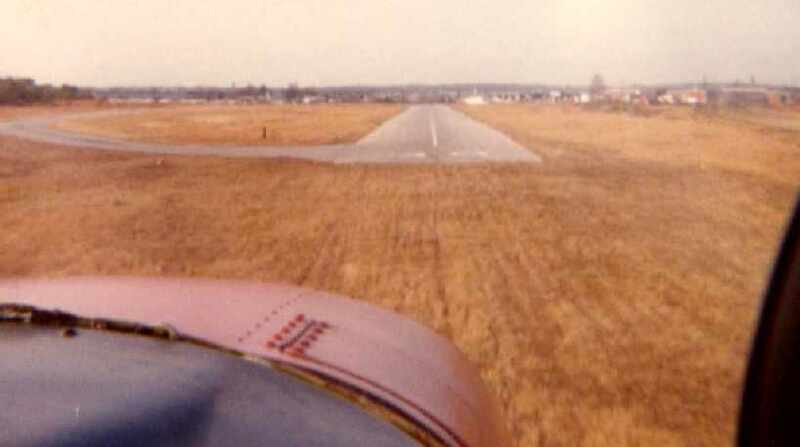 A January 1967 aerial view by Daniel Levy (courtesy of Mike Mchat) looking south at Zahn's Airport on crosswind leg after takeoff. 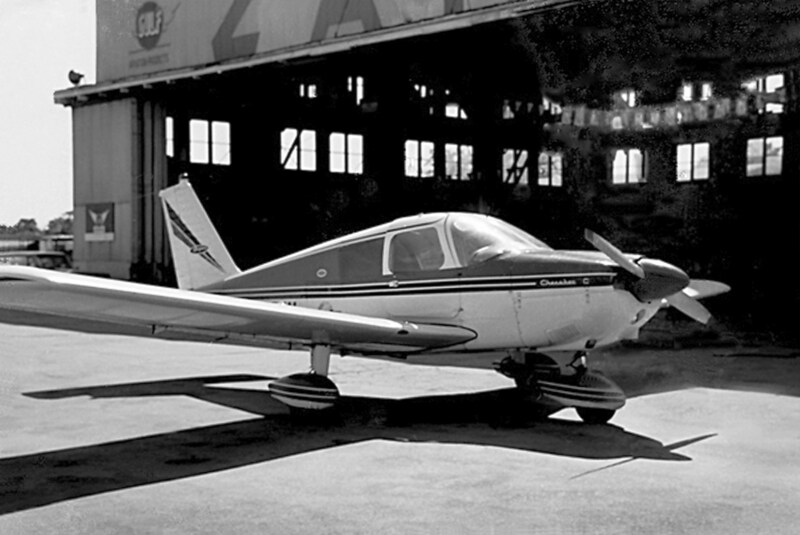 An April 1967 photo by Andrew Bonime (courtesy of Mike Machat) of a Piper Cherokee 180C N8496W in front of classic Zahn's Airport hangar. and soloed in J-3 N70581 in November 1969. I thought I was taking off in a jet fighter! ...the acceleration was exhilarating! This flight was the ONLY one in my 18,000-hour career where I lost an engine. I was so enamored by the fact that I was soloing that I forgot carb heat... and it was a cold day in November. and took my private check ride with Ed Lyons in August 1970 in a PA-28-140 N6749J. (Like a TriPacer but with only front seats). At that time the local FAA GADO was still there. The North/South runway had the beach at the South end & a row of T hangars at the North end. The wind was almost always off the water all summer. they could plant you right where you crashed as there was a cemetery between the T-hangars & the railroad tracks. I logged over an hour of 90 degree crosswind take offs & landings on it that June." my 1st flight was in a Piper PA -28 Cherokee 180. The east/west runway was used as often as the wind changed from the prevailing to east/west. the dip occurred roughly at the rotation point of the take roll - you were airborne with little to no effort. same thing at the south runway approach over the T-hangars at the north end of the property. When taking off north (from the south end of field) it was difficult to see traffic on final due to tree & houses. an old rotting away Fairchild PT-26, and later day C-150s. I took my ground school in classrooms in the large hangar at the east end of the field - taught by Dan Foote." Thomas Lembessis recalled, "I learned to fly at Zahn's in 1972. There was no other airport like it. If they were around today, I would have definitely based my plane there. They weren't the newest. Their facilities were a shambles. But these people knew how to fly, unlike anyone else. 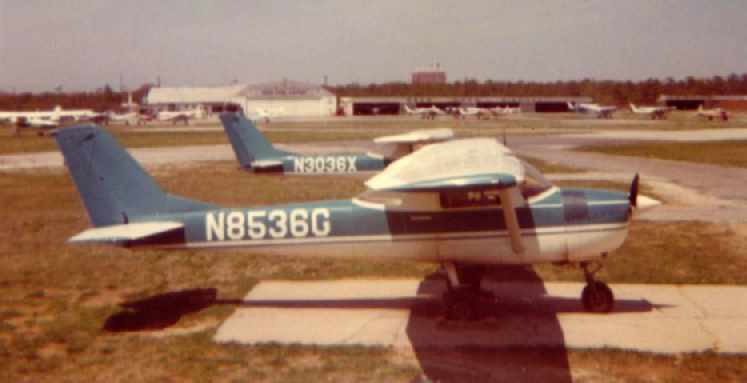 a Cherokee 140 owned by Zahns, in which I flew my first solo flight in. What a memory!" An August 1975 photo by Mike Machat of a Amityville Flying Service Piper J-3 Cub N2038M preparing to taxi out for takeoff at Zahn's Airport. Joe Ricciardi reported, “The guy in the airplane [backseat] was me! 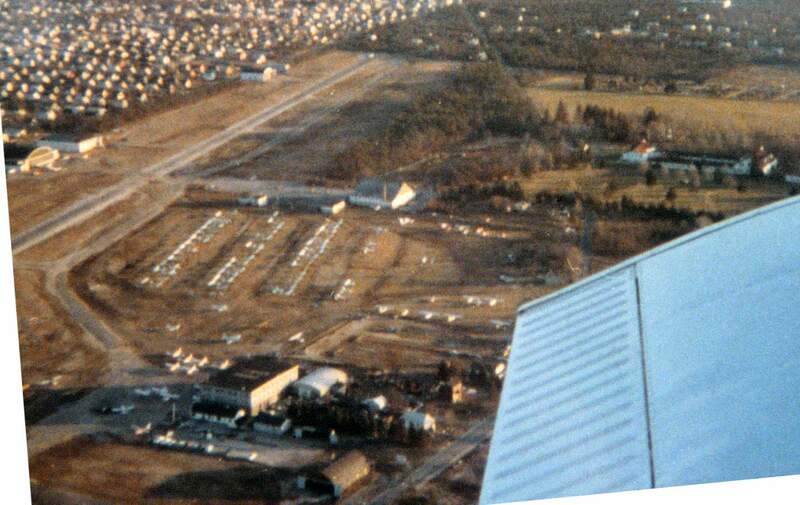 A 1978 aerial view showing the huge number of general aviation aircraft based at Zahn's Airport. An October 1978 photo by Dave Welch of a Piper J3C-65 Cub at Zahn's Airport. 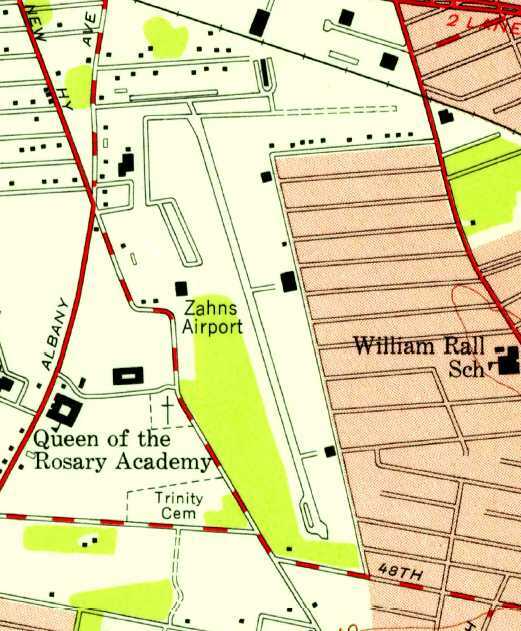 The 1979 USGS topo map depicted Zahn's as having 2 runways. A circa 1978-79 aerial view by Gary Agranat of a hangar at Zahn's. A circa 1978-79 photo by Gary Agranta of Ercoupes in front of a hangar at Zahn's. According to Gary Agranet, Ed Lyons owned the field & also ran Amittyville Flying Service. 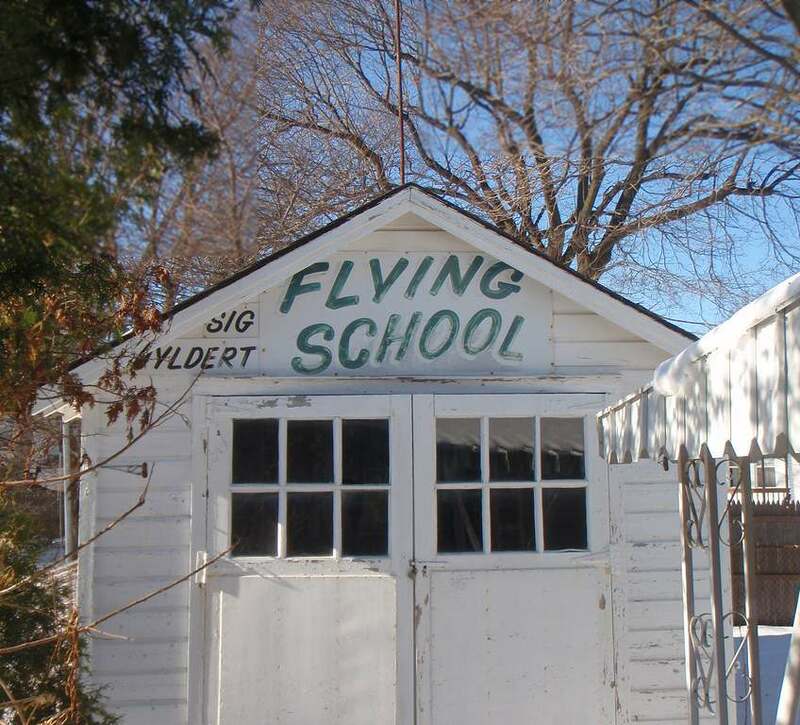 In Gary's words, "My first flight lesson started here. One day I just walked in to that shack on the right. I told the man behind the desk that I wanted to take flying lessons. He had me fill out some paperwork. And then off I went. I continued to take lessons here for almost a year. The type of aircraft I flew was the Piper Cherokee 140. The 140 was nothing fancy. But it was rugged. 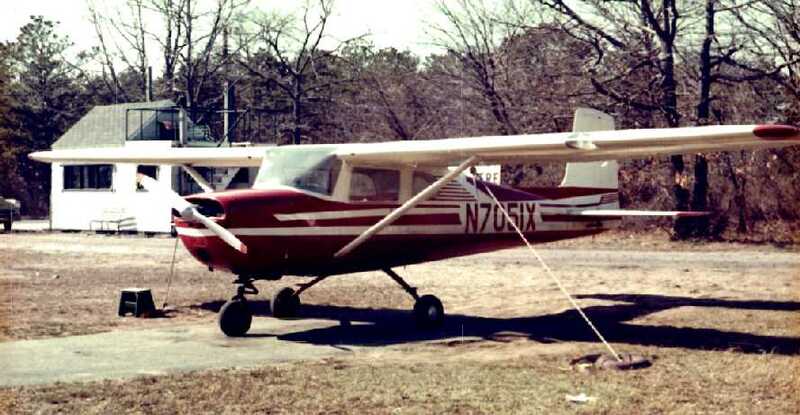 The school also had Cherokee 180's & Piper Cubs, but I didn't get the chance to fly those." Gary continued, "Zahns was a small uncontrolled airport with its own unique character. It was home to lots of small airplanes, old hangar, and tall grass. The field was quiet, but not too quiet. It was located on Long Island about 40 miles east of downtown New York City. It was far enough from the city that you didn't have to compete with the city commercial air traffic. But it was still close enough to get enough air traffic to keep you alert." Gary continued, "The runway pattern was shaped like a 'T'. Most of the time I used the longer north/south runway. The shorter east/west runway ran along the north side of the field. Just to the north of that was a line of small hangars. And beyond that was a mainline track of the Long Island Railroad. but the east/west runway seemed to me to have more. I only used that short runway once, when there was a strong westerly wind blowing right down it. that strong gusty wind or that very short runway with its potholes & the hangars so close!" Gary continued, "At Zahns you still did have to be aware of traffic. Just within a mile to the north was Republic Airport in Farmingdale. It had a control tower, jet traffic & an ILS instrument approach. Zahns' airport traffic pattern fit just between the approaches to Republic's runways 1 & 32. And above 3,000' overhead was the outer ring of the terminal control area for JFK International. You learned the controlled airspace demarcations & prominent landmarks very quickly. Unfortunately, Zahns closed about a year after I started flying." 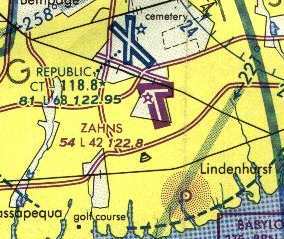 Zahn's was still depicted as an active airfield on the 1979 NY TCA chart (courtesy of Bill Suffa). It was depicted as having 2 paved runways, with the longest being the 4,200' north/south runway. An undated photo of the "Whitney Hangar", which was built to house the DC-3 of John Hay Whitney. There were office/shop areas along both the north & south wall; hence, the windows were up high. A 4/30/80 photo of the last plane to leave Zahn's Airport. The field was closed at sunset. Steve Moddle recalled, “After Zahn's closed I was able to buy N2038M from Jack Looney, one of the owners of the airport. Zahn's was bought by the town in 1980 & turned into an industrial park. 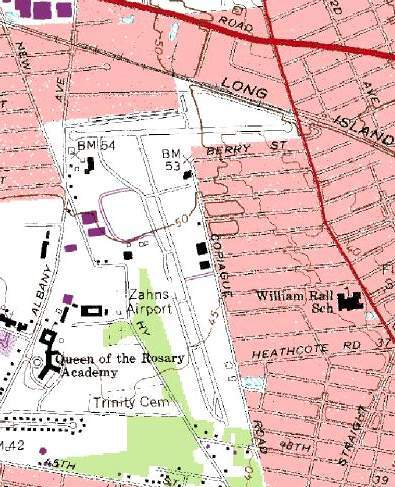 but the outlines of both former runways were still apparent. 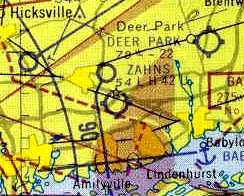 The June 1981 NY Sectional Chart (courtesy of Ron Plante) depicted Zahns as an abandoned airfield. 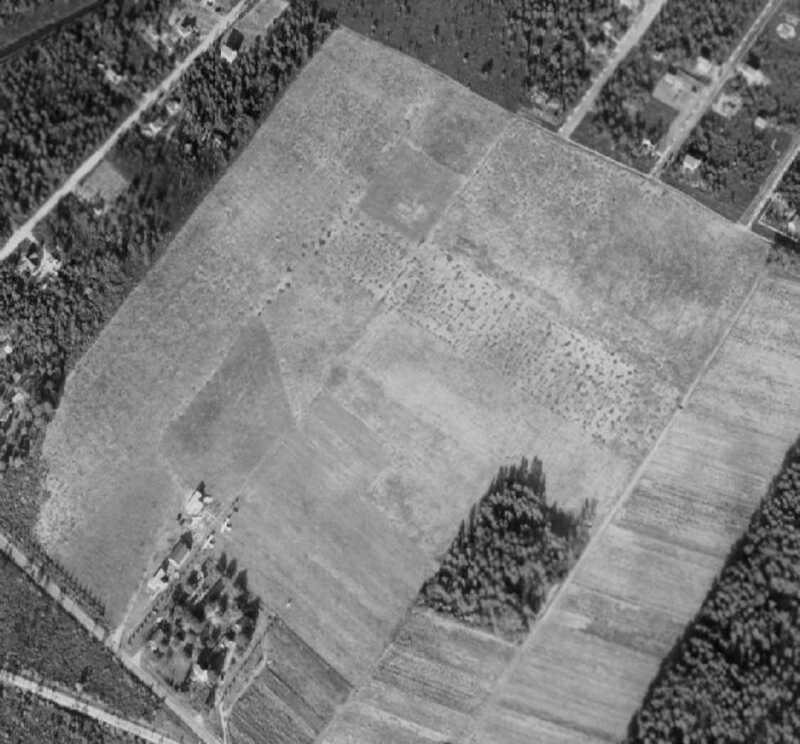 A 4/8/94 USGS aerial photo showed that not a trace remained of the field. 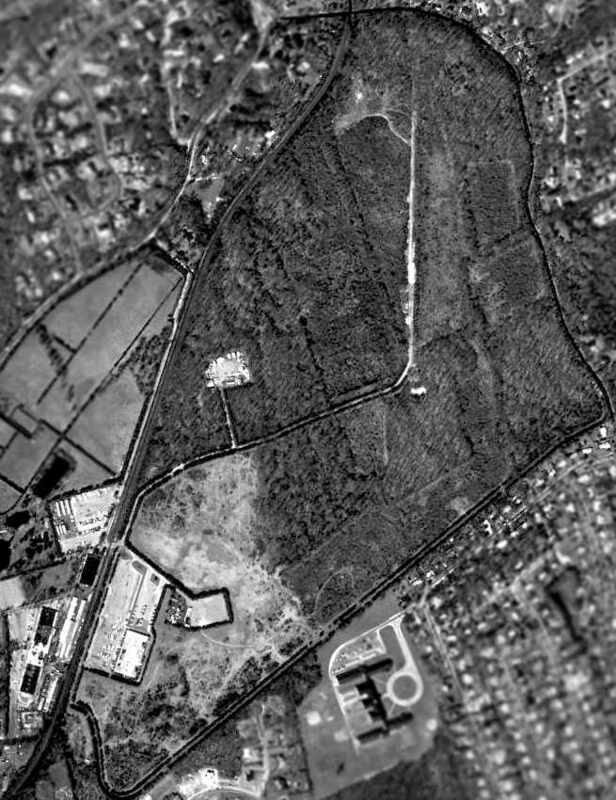 A 5/4/09 aerial photo showed no obvious trace remaining of Zahn's Airport. 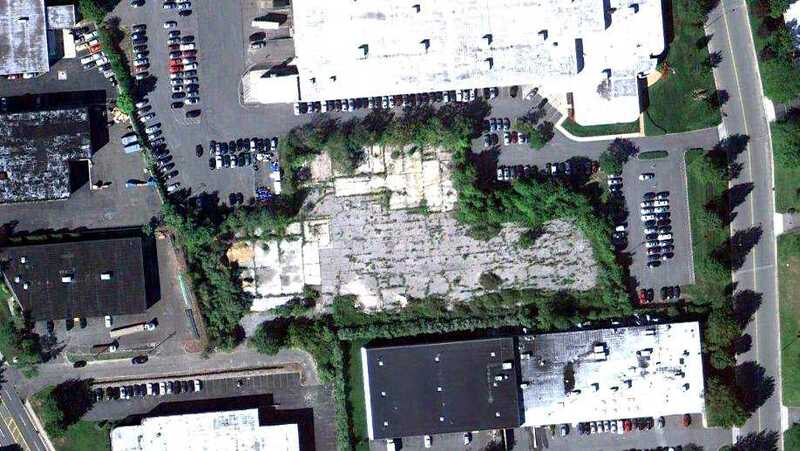 a shed located in Farmingdale (possibly relocated from the airport site?) bearing a sign for Sig Uyldert Flying School. the rutted pavement which appears to be the foundation of the National Guard hangar on the west side of Zahn's Airport. John LeVasseur reported, “I discovered what appears to be a remnant of Zahn's contained within the industrial park now located there. 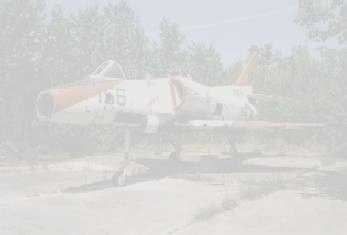 I decided to go there & see if what I saw on the image was actually something left of the old airport. I was able to find some post holes, foundation footings which match fairly well to your image [of the National Guard hangar]. I also found a brass metal strip sticking out of the ground. I pulled it out & it was embossed with the phrase, 'Property of the U.S. DOD', so I suspect this may be the area of the National Guard hangar. I did a little digging with the town & discovered there was a small parcel of land on the site that the town could not purchase due to the fact it was owned by the US Department of Defense. I suspect it was sold by Zahn's for use for the National Guard area within Zahn's. 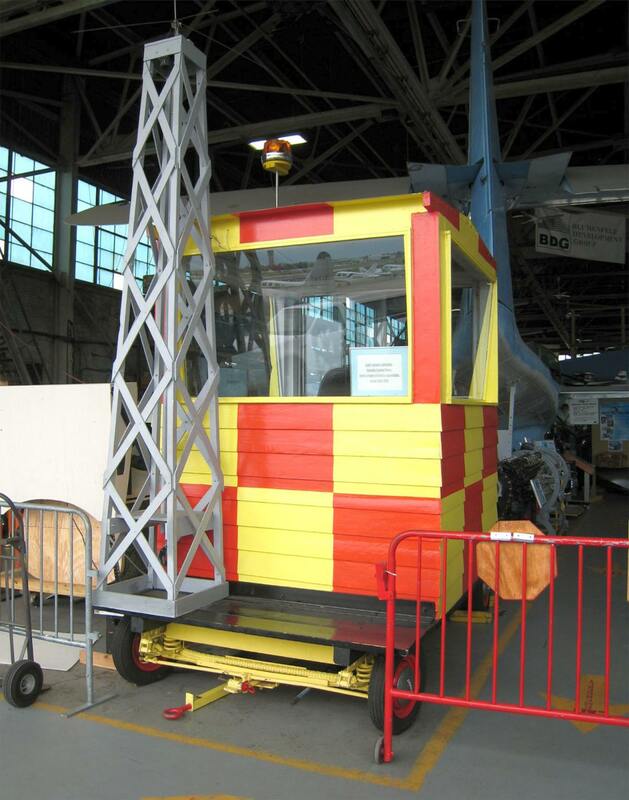 A 2012 photo by Mike Machat of a restored Zahn's Airport Mobile Tower, seen at the American Airpower Museum on Republic Field in Farmingdale. Thanks to Brett for pointing out this airfield. See also: Wings Magazine, 8/02. 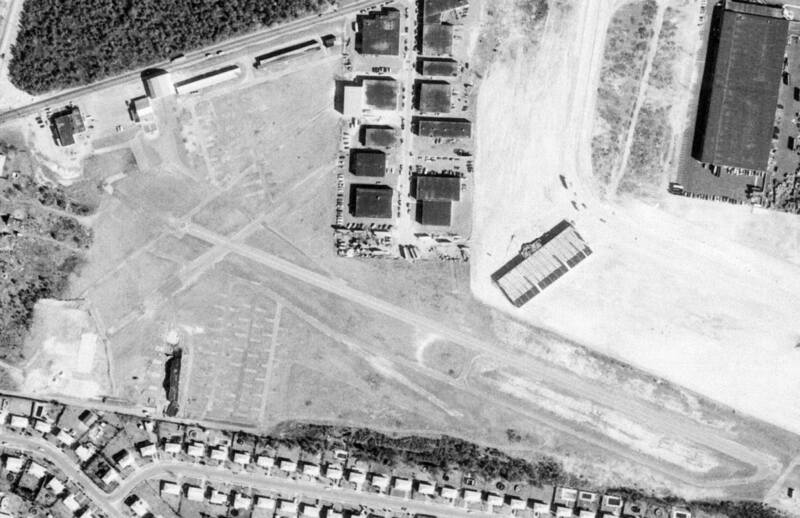 A 1962 aerial view of the Nike Battery NY-24 Launch Site, showing its proximity to the planes parked at Zahn's Airport across the street to the east. In 1957, the Army built a Nike surface-to-air missile battery across the street, adjacent to the west side of Zahn's Airport. Nike Battery NY-24 was situated to provide protection to Republic Aviation's plant at Republic Airport. It was of a somewhat unusual configuration, having 3 of the larger type "B" missile magazines. These accommodate 30 of the 1st-generation Nike Ajax missiles. in which configuration it accommodated 18 of the larger Nike Hercules missiles. Battery NY-24 was manned by the Army's A/505th from 1957-1958, and the A/3/51st from 1958-1964. It was transferred to the Army National Guard in 1964, who manned it with the A/1/244th. 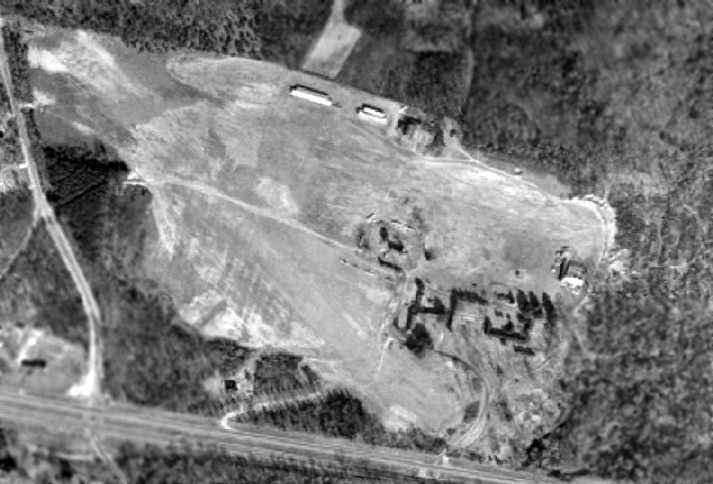 The earliest photo that has been located of the NY-24 Launch Site was a 1966 aerial view. and an earthen berm for shielding missile fueling operations to the east of the launchers. Battery NY-24 was one of the longest-lived Nike missile facilities in the New York Defense Area, remaining active until 1974.
made an emergency landing at nearby Jones Beach, a popular bathing beach on Long Island's south shore. until the mysterious cargo could be flown away in yet another helicopter. A 1980 aerial view of the Nike Battery NY-24 Launch Site, after it had been abandoned. The concrete base of the launchers were still recognizable, but the earthen berm to the east had been removed. The entrance to the NY-24 Launch Site is on the west side of Albany Avenue, south of New Highway. It is presently utilized as an Army Reserve center. 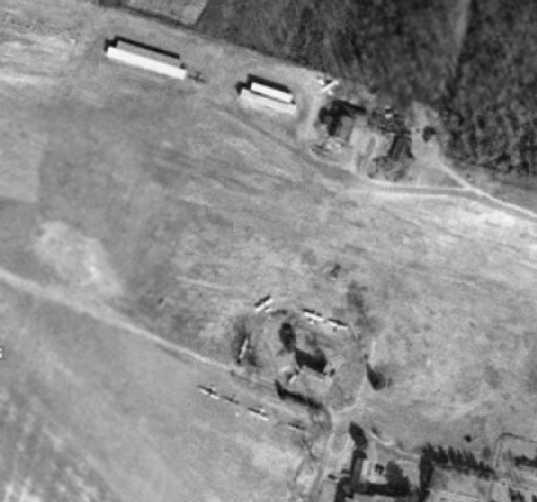 The missile magazines have been paved over & used as a motor pool, but were still identifiable in a 2006 aerial photo. All other buildings are still intact as well as the double fence & original lights. The Integrated Fire Control Site was located 1 mile to the northwest. The entrance is on the west side of Baiting Place Road, south of Allen Blvd. and is labeled "US Military Reservation" on the 1979 USGS topo map. The administration building & barracks are intact & in use by the NYARNG. Five radar towers remain standing, which previously mounted ACQR, LOPAR, ABAR & HIPAR radars. 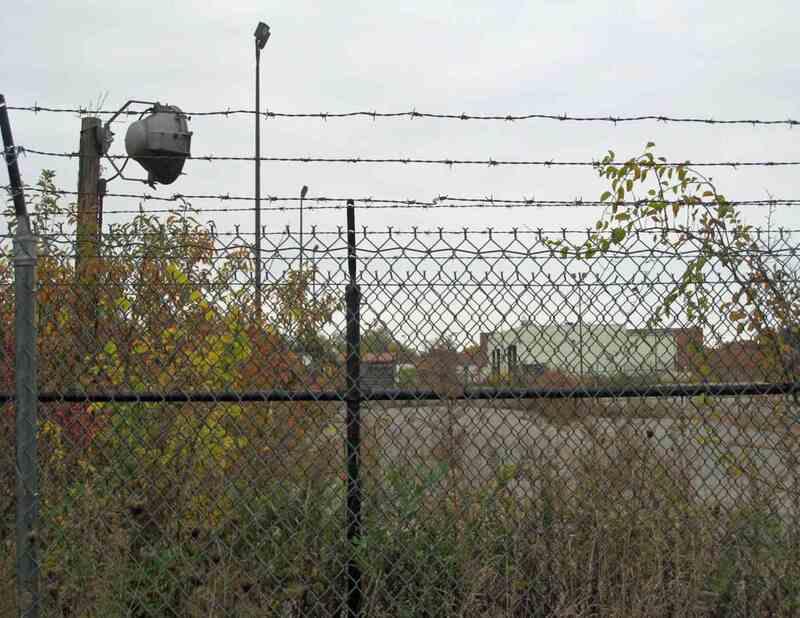 A 2012 photo by Mike Machat of the “Last remaining vestige of the Nike Hercules Site across the street from Zahn's Airport: an original perimeter light & barbed-wire fence. 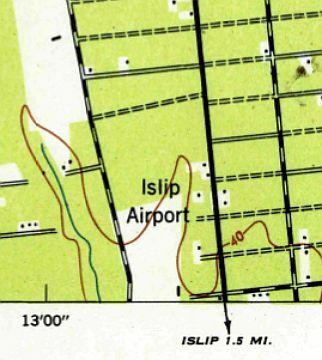 Deer Park Airport, one of an amazing number of airports depicted on Long Island on the 1947 USGS topo map. as it was not depicted on the 1945 NY Sectional Chart. 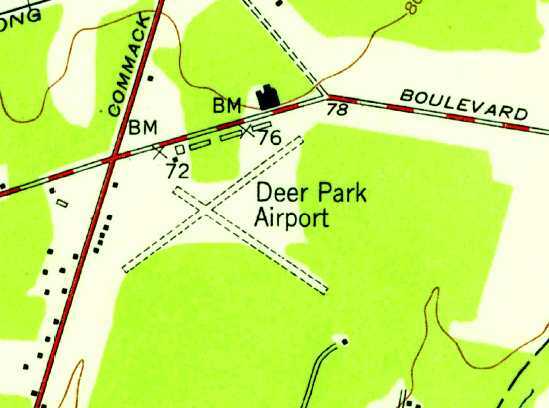 The earliest depiction of Deer Park Airport which has been located was on the 1947 USGS topo map. 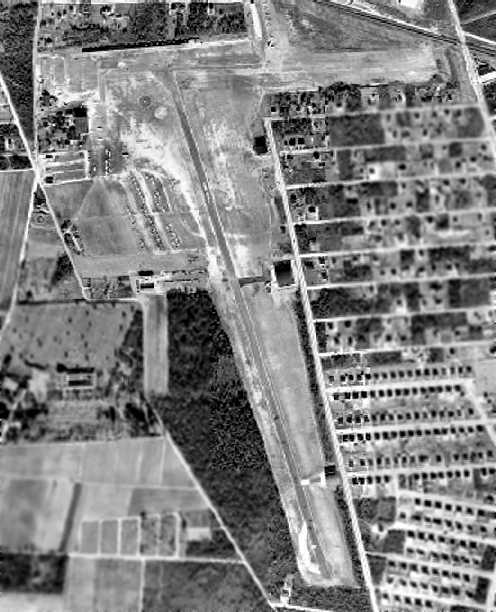 The earliest photo of Deer Park Airport which has been located was a 1947 aerial view. It depicted Deer Park Airport as having 2 unpaved runways. and a half-dozen light aircraft were parked along the north & west sides of the field. A 1949 photo of Neil Angus in front of a Ryan PT-22 & a Deer Park hangar (courtesy of Neil Angus Jr.). which described the field as having a 2,200' unpaved runway. A 12/3/53 aerial view depicted Deer Park Airport as having 2 unpaved runways. and dozens of light aircraft were parked along the north & east sides of the field. 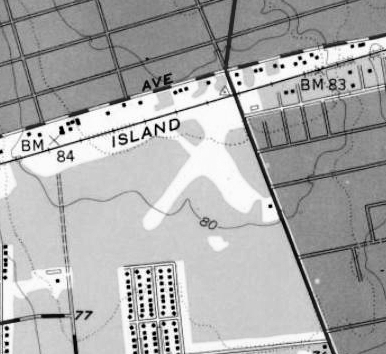 The 1954 USGS topo map depicted Deer Park Airport as having 2 unpaved runways, with several buildings along the north side. A 1959 photo by Edd Weninger of a PT-22 at Deer Park Airport. listed & the operators as Mid-Island Air Service & Deer Park Aviation Center. Andy Klarmann recalled, "Deer Park was owned by Lou Mancuso." with the entrance to Mid Island Air Service on the South side of Grand Boulevard. 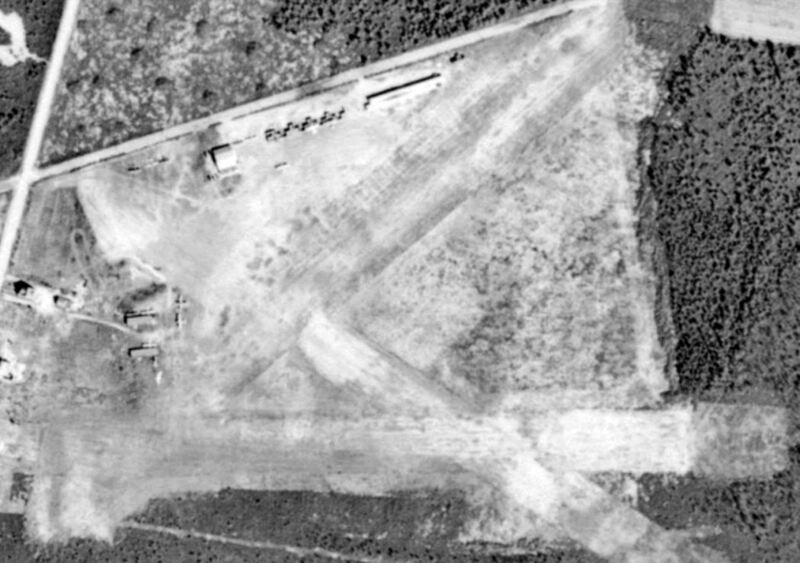 (the black line in the aerial view pointing at the West end of Runway 12/30). My TriPacer was tied down in the area just East of it. I flew from there from 1967 until just before they closed in 1974. During that time there was only one (paved) Runway 12/30. as they continued complaining about noise even after it was closed. because there were industrial buildings in that area in 1967." A circa 1971-73 aerial view by Andy Klarmann, from 2,000’ looking northwest at Deer Park's Runway 30 approach end. 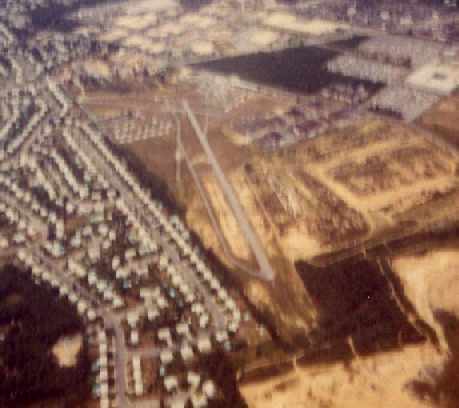 A circa 1971-73 aerial view by Andy Klarmann while on final very short final approach to Deer Park's Runway 30. "You used all 2,375’, but from the condition of the grass short of the runway we rarely landed short." with the Mid Island Air Service hangar across the field, and the Edgewood Hospital main building in the background. A circa 1971-73 photo by Andy Klarmann looking north on Commack Road at the Allied sign at the entrance to Deer Park. "It was Autumn in more ways than one." An aerial view by Lonnie McLaughlin of Deer Park Airport in 1972 (note the X'ed-out crosswind runway). 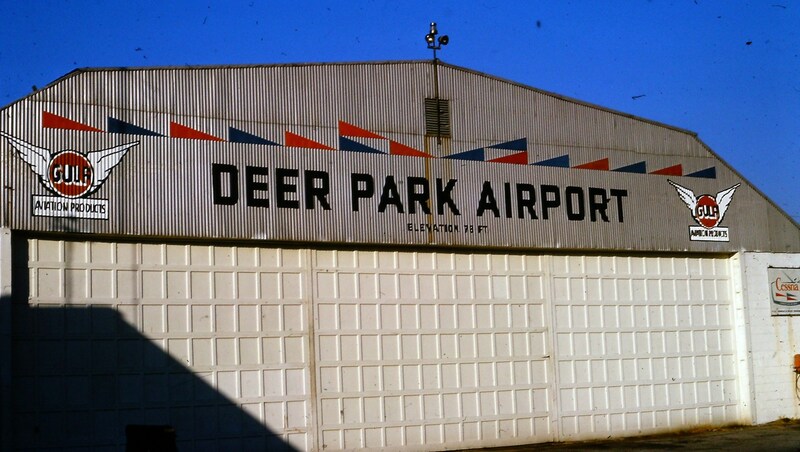 A circa 1972-74 photo by James Kovacsik (courtesy of Bob Mott) of a Deer Park Airport hangar. A circa 1972-74 photo by James Kovacsik (courtesy of Bob Mott) of a Cessna 150 or 152 in front of Deer Park Airport hangars. A 1973 photo by Andy Klarmann of "of the notice which appeared at the airport entrance one morning. As with most things the deal was already done & Deer Park was closed by early 1974. It was no longer a place where a kid on a bike could hang on the fence or trade working the line for flying lessons. I think those days are gone forever." which depicted Deer Park as having 2 paved runways, with the longest being 2,400'. According to Andy Klarmann, "The last 2 operators were Mid Island Air Service (airport owner) and Allied Flyers. 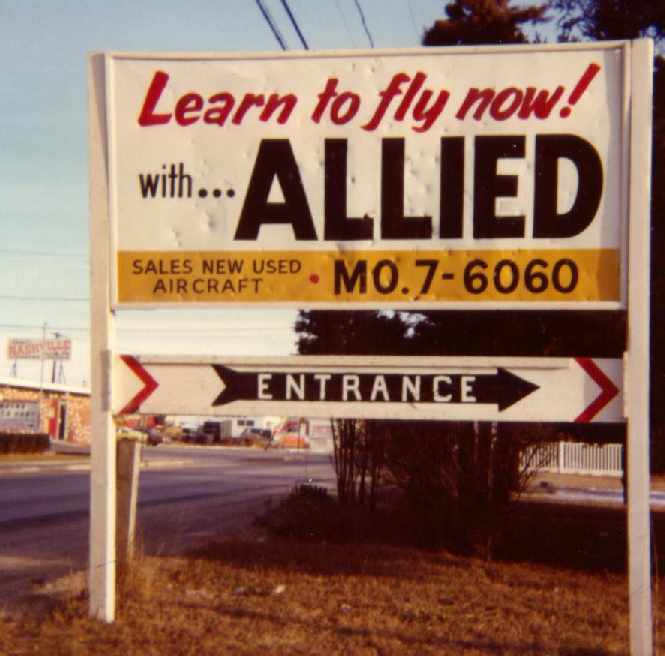 Allied relocated to Islip MacArthur Airport. was flown by my flight instructor, Bill Burke. This was about a week after the runways were X'ed out. He got caught out with a student in a snow squall & could not get back into ISP." devoid of aircraft, and with a row of buildings having already covered the northeastern end of the southwest/northeast runway. Deer Park Airport was no longer depicted at all (not even as an abandoned airfield). A 1980 aerial view showed that one former hangar still remained standing on the north side of the field. and all traces of the former airport appeared to be gone. and that the remains of the numbers of Runway 30 were still visible. five miles northeast of Republic Airport.